This invention relates to deployable hemostatic materials comprising chitosan fibers. The hemostatic materials are suitable for use in sealing or controlling active bleeding from artery and vein lacerations and punctures, and for controlling oozing from tissue. 本发明涉及包括壳聚糖纤维的可展开的止血材料。  The present invention relates to expandable hemostatic material comprising chitosan fibers. 该止血材料适用于封闭或控制动脉和静脉破口和穿刺的活跃出血以及控制组织渗血。 The hemostatic material is suitable for a closed control or artery and vein laceration and brisk bleeding puncture tissue and control bleeding. 手术操作和外伤通常有大量血液流失的现象。  trauma and surgical procedures usually have a lot of blood loss phenomenon. 处理血液流失的常规方法如手动按压、烧灼或缝合比较耗时，且并不总是能有效地控制出血。 Conventional blood processing methods, such as the loss of manual pressure, cauterization, or sutures time consuming, and are not always effective in controlling bleeding. 多年来，已经开发了众多局部止血剂来控制手术过程中和来自外伤伤口处的出血。  Over the years, many have been developed to control the topical hemostatic agent during surgery and bleeding from the trauma of wounds. 某些止血剂，如胶原质为基础的粉末、海绵和织物都具有微粒特性。 Some hemostatic agents, such as collagen-based powder particles have a sponge and fabric properties. 微粒型的止血剂为自然的血栓形成提供了网格，但不能在凝血病患者中增强这一过程。 Microparticulate natural hemostatic agent to provide a grid thrombosis, but not in patients with enhanced coagulation process. 微纤维状的胶原（微粒型止血剂）为粉末形式，并刺激患者内源的止血级联反应。 Microfibrillar collagen (type particle hemostatic agent) in powder form, and stimulation of endogenous haemostatic patient cascade. 然而，据报道这种试剂会形成栓塞，并且如果在心肺分流术中使用时会诱导局部炎性反应。 However, this agent is reported to form embolism, and induce local inflammatory response if used in cardiopulmonary bypass surgery. 如凝血酶的药理学活性试剂可以和微粒载体结合使用，例如用凝血酶浸泡的明胶海绵或粉末。 The thrombin pharmacologically active agent and particles may be used in conjunction with a carrier, e.g. thrombin or soaked Gelfoam powder. 凝血酶已经被用于控制弥漫性出血表面的出血，但由于缺乏可供凝血块附着的框架而限制了其用途。 Thrombin has been used to control bleeding surface diffuse hemorrhage, but the lack of adhesion of the clot for frame and limit its use. 同源和异源的纤维蛋白胶可引起凝血块的形成，但不能良好地附着在湿润的组织上，因此对活跃出血的伤口的作用很小。 Homologous and heterologous fibrin glue can cause blood clot formation, but can not be well adhered to the wet tissue, so the effect of active bleeding wound is small. 需要一种可生物吸收的止血材料，其具有出众的止血作用，并可制成多种适用于控制各种伤口出血的形式。  The hemostatic material needed is a bioabsorbable, having superior hemostatic effect, can be made into a variety of forms suitable for the control of various bleeding of a wound. 同时，还需要同时适用于手术应用和野外外伤治疗的止血材料。 At the same time, also we need to apply hemostatic material surgical applications and field trauma treatment. 例如，在血管手术中，出血是个很大的问题。 For example, in vascular surgery, the bleeding is a big problem. 在心脏手术中，由体外分流术诱导的凝血病复杂化的多重血管吻合和套管插入位点可导致出血，且这种出血只能通过局部止血钳来控制。 In cardiac surgery, induced by extracorporeal shunt coagulopathy complicated multiple vascular anastomoses and cannulation sites can result in bleeding, bleeding and this can only be controlled by topical hemostats. 在脊椎手术过程中快速和有效的止血，即对骨、硬膜上和/或硬膜下出血，或不适于进行缝合或烧灼的脊髓的出血进行控制，可以使伤害神经根的可能性最小化，并缩短操作时间。 Rapid and effective hemostasis during spinal surgery, i.e. bone, subdural upper and / or subdural bleeding or spinal cord is not suitable for suturing cauterized or bleeding control, the possibility of damage to the nerve root can be minimized and shorten the operation time. 在肝脏手术中，例如在活供体肝移植过程中或癌性肿瘤摘除过程中，有较高的大量出现的风险。 In liver surgery, for example, live donor liver transplantation or during the process of removal of cancerous tumors, there is a higher risk of occurrence of a large amount. 有效的止血材料可以显著改善提高这类过程中患者的结果。 Effective hemostatic material can significantly improve the results of such a process to improve the patient. 甚至在那些没有大量出血的情况下，也需要有效的止血材料，例如在如拔牙的牙科操作中，以及处理擦伤、烧伤等等。 Even in those without massive bleeding, but also requires effective hemostatic material, for example, in dental procedures such as tooth extraction, processing and abrasions, burns and the like. 在神经外科中，渗血的伤口是常见的，并且难以处理。 In neurosurgery, oozing wounds are common and difficult to handle. 因此，在第一方面提供了止血材料，该材料包括包壳聚糖纤维，其中所述壳聚糖具有约IlOOkDa或更高的分子量以及约90%或更高的脱乙酰度。  Thus, in a first aspect provides a hemostatic material, the material comprising chitosan fibers packet, wherein the chitosan has a molecular weight of about IlOOkDa higher or about 90% or more and a degree of deacetylation. 在该第一方面的优选实施方案中，所述止血材料包括无纺织物或纺织织物。  In a preferred embodiment of the first aspect, the hemostatic material comprises a nonwoven fabric or woven fabric. 在该第一方面的优选实施方案中，所述止血材料包括具有粗糙面和平滑面的无纺织物。  In a preferred embodiment of the first aspect, the hemostatic material comprises a nonwoven fabric having a rough surface and a smooth surface. 在该第一方面的优选实施方案中，所述止血材料包括无纺织物，其中两面是粗糙的。  In a preferred embodiment of the first aspect, the hemostatic material comprises a nonwoven fabric wherein both sides are rough. 在该第一方面的优选实施方案中，所述止血材料包括多个壳聚糖纤维层。  In a preferred embodiment of the first aspect, the hemostatic material comprises a plurality of chitosan fiber layers. 在该第一方面的优选实施方案中，所述壳聚糖纤维经乙酸溶液处理。  In a preferred embodiment of the first aspect, the chitosan fibers treated with acetic acid solution. 在该第一方面的优选实施方案中，所述壳聚糖纤维经冰醋酸处理。  In a preferred embodiment of the first aspect, the chitosan fibers by glacial acetic acid. 第二方面提供了制备包括壳聚糖纤维的止血材料的方法，其中所述壳聚糖具有约IlOOkDa或更高的分子量以及约90%或更高的脱乙酰度，该方法包括提供第一壳聚糖纤维层；对第一壳聚糖纤维层使用弱酸；并且将第二壳聚糖纤维层置于第一壳聚糖纤维层之上，由此得到止血材料。  A second aspect provides a process for preparing a hemostatic material comprising chitosan fibers, wherein the chitosan has a molecular weight of about IlOOkDa or more and about 90% or greater degree of deacetylation, which method comprises providing a first chitosan fiber layer; a first chitosan fiber layer, the use of a weak acid; and a second chitosan fiber layer is disposed over the first chitosan fiber layer, whereby a hemostatic material. 在该第二方面的优选实施方案中，至少重复一次所述步骤。  In the preferred embodiment of the second aspect, said step repeated at least once. 在该第二方面的优选实施方案中，所述方法还包括加热止血材料的步骤，由此液体从止血材料中蒸发。  In a preferred embodiment of the second aspect, the method further comprising the step of heating the hemostatic material, whereby the liquid is evaporated from the hemostatic material. 在该第二方面的优选实施方案中，所述方法还包括在第一表面和第二表面之间压缩止血材料；并加热止血材料，由此得到干燥的止血材料。  In a preferred embodiment of the second aspect, the method further comprises between the first and second surfaces compressing the hemostatic material; and heating the hemostatic material, whereby a dry hemostatic material is obtained. 在该第二方面的优选实施方案中，所述弱酸包括乙酸溶液。  In a preferred embodiment of the second aspect, the weak acid comprises an acetic acid solution. 在该第二方面的优选实施方案中，所述弱酸包括冰醋酸。  In a preferred embodiment of the second aspect, the weak acid comprises glacial acetic acid. 在该第二方面的优选实施方案中，所述弱酸包括pH值约3. 0至约4. 5的乙酸溶液。  In a preferred embodiment of the second aspect, the weak acid comprises acetic acid solution to a pH of about 3.0 to about 4.5. 第三方面提供了处理伤口的方法，所述方法包括对伤口使用止血材料的步骤，由此控制出血或渗血，所述止血材料包括壳聚糖纤维，其中所述壳聚糖具有约IlOOkDa或更高的分子量以及约90%或更高的脱乙酰度。  A third aspect provides a method of treating a wound, the method comprising the step of using the hemostatic material to the wound, thereby controlling bleeding or oozing, the hemostatic material comprising chitosan fibers, wherein the chitosan has IlOOkDa a higher molecular weight, or about about 90% or more and a degree of deacetylation. 在该第三方面的优选实施方案中，所述止血材料以选自蓬松物、海绵和织物的形式存在。  In a preferred embodiment of the third aspect, the hemostatic material is in the form selected from puff, sponges, and fabrics. 在该第三方面的优选实施方案中，所述伤口选自瘤床、肝脏伤口和脑部伤口。  In a preferred embodiment of the third aspect, the tumor is selected from the wound bed, the wound liver and brain wound. 在该第三方面的优选实施方案中，所述伤口选自动脉穿刺伤口、静脉穿刺伤口、动脉破口伤口和静脉破口伤口。  In a preferred embodiment of the third aspect, the wound is selected from arterial puncture wound, a venous puncture wound, arterial laceration wound, and a venous laceration wound. 在该第三方面的优选实施方案中，所述壳聚糖纤维经冰醋酸处理。  In a preferred embodiment of the third aspect, the chitosan fibers by glacial acetic acid. 图1提供壳聚糖毛绒的扫描电子显微照片（SEM)图像。  Figure 1 provides a scanning electron micrograph of chitosan fleece photograph (SEM) images. 图2显示用止血蓬松物封闭股动脉穿刺口。  Figure 2 shows a hemostatic puff femoral artery puncture closure. 将可膨胀、可吸收、生物相容的壳聚糖蓬松物经皮肤切口放置在所述穿刺伤口上。 Expandable, resorbable, biocompatible chitosan puff skin incision was placed on the puncture wound. 所述止血蓬松物膨胀，并保持其自身位置抵靠所述动脉血管壁，从而封闭所述穿刺。 The hemostatic puff expand and maintain its own position against the arterial wall, thereby closing said puncture. 图3显示用止血毛绒封闭动脉穿刺的设备。  FIG. 3 shows the closure device artery puncture with a hemostatic plush. 图5显示制备壳聚糖纤维的设备的示意图。  FIG. 5 shows a schematic view of apparatus for preparing chitosan fibers. 图6提供包括加料器、松散机、梳理机、输送带和卷切机的壳聚糖毛绒生产装配线示意图。  Figure 6 provides a schematic view of chitosan fleece comprises a production assembly line feeder, loose machines, carding machines, conveyors, and roll cutting machine. 图7提供负载有15%微孔多糖微球的壳聚糖毛绒的扫描电子显微照片。  Figure 7 provides a load with a scanning electron micrograph of chitosan fleece 15% microporous polysaccharide microspheres. 图8提供负载有60%微孔多糖微球的壳聚糖毛绒的扫描电子显微照片。  FIG. 8 provides a load with a scanning electron micrograph of chitosan fleece 60% microporous polysaccharide microspheres. 图9A和9B提供融合或结合在壳聚糖纤维上的微孔多糖微球的扫描电子显微照片。  FIGS. 9A and 9B provide fused or conjugated scanning electron micrographs of microporous polysaccharide microspheres on the chitosan fiber. 以下描述和实施例示例性地对本发明的优选实施方案进行了详细说明。  The following description and examples of preferred exemplarily embodiments of the present invention will be described in detail. 本领域所属技术人员可以理解，本发明范围应包括本发明的众多变体和修改。 Those skilled in the art can understand the scope of the present invention include numerous variations and modifications of the invention. 因此，这些对优选实施方案的说明不应视为对本发明范围的限制。 Thus, the description of preferred embodiments should not be considered as limiting the scope of the present invention. 止血是指阻止出血，其可以通过正常血管收缩、非正常的阻塞、凝结或手术方式来实现。  The hemostatic means to prevent the bleeding, which may be through normal vasoconstriction, abnormal obstruction, coagulation or surgical manner. 通过凝结来止血依赖于血浆凝结和溶解纤维蛋白的蛋白、血小板及血管系统的复杂相互作用。 Complex protein, platelet and the vascular system to stop the bleeding by coagulation depends on plasma coagulation and fibrinolytic interactions. 止血有三类：初级止血；二级止血和三级止血。 Hemostatic three categories: primary hemostasis; two hemostasis and hemostatic three. 初级止血定义为初级血小板栓塞的形成。  is defined as the formation of the primary the primary hemostatic platelet plug. 其涉及血小板、血管壁和von Willebrand因子。 It relates to platelets, vascular walls, and von Willebrand factor. 血管壁受伤后首先发生血管收缩。 Vasoconstriction of the vessel wall after the injury occurs first. 血管收缩不仅延缓了向血管外的血液流失，并且降低了局部血流量，促进了血小板对暴露的内皮下表面的粘附和凝结过程的活化。 Vasoconstriction only delaying extravascular blood loss, and reduced local blood flow, promote platelet adhesion and activation of endothelial coagulation process of the lower surface exposed. 初级血小板栓塞的形成包括血小板粘附、血小板活化、然后聚集形成血小板栓塞。 Formation of the primary platelet plug comprising platelet adhesion, platelet activation, aggregation and platelet plug formation. 在血小板粘附中，血小板粘附到暴露的内皮下膜。  In the platelet adhesion, platelet adhesion to the exposed subendothelial membrane. 在诸如微血管系统的高剪切速率的区域中，这由von Willebrand因子（vWf)来介导，其与血小板膜中的糖蛋白Ib-IX结合。 In the region of high shear rates, such as the microvasculature, which is mediated by the von Willebrand factor (of vWf), which binds to the platelet membrane glycoprotein Ib-IX. 在诸如动脉的低剪切速率的区域中，纤维蛋白原通过结合到血小板受体介导了血小板对内皮下膜的结合。 In the area of ​​low shear rate, such as arteries, by binding of fibrinogen to the platelet receptor mediates the binding of platelet membrane inner skin. 血小板到血管壁的粘附将其活化，引起血小板变形，从而活化其表面的胶原受体，以释放出α和致密颗粒组分。 Platelet adhesion to the vessel wall to be activated, causing platelet deformation, thereby activating the surface of collagen receptors, and to release α dense particulate component. 所述活化的血小板还合成并释放血栓烷Α2和血小板活化因子，它们为强力的血小板聚集激动剂和血管收缩剂。 The activated platelets also synthesized and released Α2 thromboxane and platelet activating factor, which aggregation agonists are potent vasoconstrictor and platelet. 血小板聚集包括活化、募集以及另外的血小板与粘附的血小板的结合。  Platelet aggregation involves the activation, recruitment and binding of platelets and platelet adhesion further. 诸如血栓烷2、PAF、ADP和血清素的血小板激动剂促进这一过程。 2, such as thromboxane, Platelet agonists PAF, ADP and serotonin facilitate this process. 通过凝血级联作用产生的另一种血小板激动剂凝血酶加强这种活化。 Another platelets by thrombin action as an agonist coagulation cascade strengthen this activation. 血小板聚集主要由纤维蛋白原介导，该纤维蛋白原结合到相邻血小板上的糖蛋白Ilb/IIIa上。 Platelet aggregation is mediated by fibrinogen mainly, fibrinogen binding to the glycoprotein Ilb on adjacent platelets / IIIa. 这种聚集导致初级血小板栓塞的形成，而纤维蛋白的形成则稳定了这种聚集。 This aggregation results in the formation of the primary platelet plug to form a stable fibrin is this aggregation. 在二级止血中，通过凝血级联形成了纤维蛋白，该凝血级联涉及循环凝血因子、钙和血小板。  In the secondary hemostasis, fibrin formed via the coagulation cascade, the coagulation cascade involves circulating coagulation factors, platelets and calcium. 所述凝血级联包括三种途径：内源、外源和共同途径。 The coagulation cascade consists of three ways: endogenous, exogenous and common pathway. 所述外源途径涉及组织因子和因子VII复合物，其活化因子X。  The extrinsic pathway involves factor VII and tissue factor complex, which activates factor X. 所述内源途径涉及高分子量的激肽原、激肽释放酶原和因子XII、XI、IX和VIII。 The intrinsic pathway involves a high molecular weight kininogen, prekallikrein and factor XII, XI, IX and VIII. 因子VIII充当因子X的因子IX介导的活化的辅助因子（与钙和血小板磷脂）。 Activated factor IX mediated factor VIII acts as a cofactor for Factor X (with calcium and platelet phospholipid). 所述外源途径和内源途径在因子X 的活化上汇合。 The exogenous and endogenous pathway pathways converge at the activation of factor X. 所述共同途径包括因子X介导的从凝血酶原产生凝血酶（因子V、钙和血小板磷脂对其有促进作用），以及从纤维蛋白原产生纤维蛋白。 The former includes a common pathway to generate thrombin from thrombin (factor V, calcium and platelet phospholipid promote its effect), and generates fibrin from fibrinogen mediated factor X. 引发凝血的主要途径是外源途径（因子VII和组织因子），而内源途径使凝血级联放大。  The main pathway is initiated coagulation extrinsic pathway (factor VII and tissue factor), while the intrinsic pathway clotting cascade. 通过外源途径借助组织因子的产生/暴露来引发凝血级联。 Produced by the extrinsic pathway by tissue factor / exposure to initiate the coagulation cascade. 组织因子由内皮细胞、内皮下组织和单核细胞表达，且表达由细胞因子上调。 Tissue factor by endothelial cells, subcutaneous tissue, and monocytes express and upregulation by cytokines. 然后组织因子结合到因子VII，该复合物活化因子X。 And tissue factor binding to factor VII, activated factor X. The complex 其后，在因子V、钙和血小板磷脂存在下，因子X将前凝血酶活化为凝血酶。 Thereafter, the factor V, calcium and platelet phospholipid present, factor X activation of prothrombin to thrombin. 该途径被称为组织因子途径抑制剂的脂蛋白相关分子迅速抑制。 Lipoprotein-associated molecular pathway is referred to as the tissue factor pathway inhibitor quickly suppressed. 然而，由这一途径产生的少量凝血酶使所述内源途径的因子XI活化，其使凝血级联扩大。 However, a small amount of thrombin produced from this pathway enables the factor XI activation of the intrinsic pathway, which causes the expansion of the coagulation cascade. 通过所述外在途径产生的少量凝血酶放大凝血级联。  The small amount of thrombin produced by way of the extrinsic coagulation cascade amplification. 这种凝血酶通过活化因子XI 和VIII将所述内源途径激活。 This is activated by thrombin activation of factor VIII to XI and the endogenous pathway. 活化的因子IX与活化的因子VIII、钙和磷脂一起被称为tenase复合物，其放大因子X的活化，产生大量凝血酶。 Activated factor IX and activated factor VIII, together with calcium and phospholipid is called tenase complex, which amplifies the activation of Factor X, a large amount of thrombin. 进而，凝血酶切割纤维蛋白原形成可溶的纤维蛋白单体，随后这些单体自发聚合形成可溶性纤维蛋白聚合物。 Furthermore, thrombin cleavage of fibrinogen to form soluble fibrin monomer, followed by polymerization of these monomers spontaneously form soluble fibrin polymers. 凝血酶还活化因子XIII，其与钙一同起交联并稳定所述可溶性纤维蛋白聚合物的作用，形成交联的纤维蛋白。 Thrombin also activates factor XIII, which together with calcium from the stabilizing effect of the crosslinked and soluble fibrin polymer, crosslinked fibrin formation. 三级止血定义为纤溶酶的形成，该酶是引起纤维蛋白溶解的主要的酶。  The three hemostasis is defined as the formation of plasmin, the enzyme is caused major enzymes of fibrinolysis. 在凝血级联活化的同时，从内皮细胞释放出组织纤溶酶原活化剂。 In the coagulation cascade is activated at the same time, the release of tissue plasminogen activator from endothelial cells. 组织纤溶酶原活化剂与凝血块内的纤溶酶原结合，将其转化为纤溶酶。 Tissue plasminogen activator and plasmin in the original clot binding, converting it to plasmin. 纤溶酶可分解凝血块内的纤维蛋白原和纤维蛋白，释放出纤维蛋白和纤维蛋白原的降解产物。 Plasmin decomposable fibrinogen and fibrin in the clot, releasing the fibrin degradation products and fibrinogen. 优选实施方案提供了与止血系统反应来治疗或预防出血的组合物和材料。  The preferred embodiments provide compositions and materials to react with the haemostatic system to treat or prevent bleeding. 特别地，该优选实施方案的组合物和材料引起血液的凝结。 In particular, the compositions and materials of preferred embodiments due to blood clotting. 在以动脉或静脉出血为特征的损伤治疗中，以及控制出血有困难的手术过程中， 例如大表面积、重度静脉或动脉出血、渗血伤口及器官破裂/切除，特别需要将止血剂有效地输送到伤口处。 Surgical procedure  In Injury to arterial or venous bleeding characterized in, and control of bleeding is difficult, for example a high surface area, severe venous or arterial bleeding, oozing wounds and organs rupture / removal, particularly desirable hemostatic agent effectively delivered to the wound. 优选实施方案的组合物和材料在将止血剂输送到伤口方面拥有诸多优点，包括但不限于容易应用和移除、生物吸收的可能性、缝合性、抗原性和组织反应活性。 Compositions and materials of preferred embodiments have many advantages in the delivery of hemostatic agents to wounds, including but not limited to, easy to apply and remove, the possibility of bioabsorbable suture, antigenicity, and tissue reactivity. 根据伤口的特性和所采用的治疗方法，优选实施方案的装置可以使用不同的形式。  The characteristics of the wound and the treatment method employed, means of preferred embodiments may use different forms. 例如，优选蓬松物、毛绒或海绵形式来控制动脉或静脉的活跃出血，或控制腹腔镜操作过程中的内出血。 For example, preferably puff, fleece, or sponge form active control bleeding artery or vein, or to control internal bleeding during laparoscopic procedures. 在经常遇到渗血性脑部伤口的神经外科手术中，优选片状形式的止血材料。 Often encountered in neurosurgery oozing brain wounds, preferably a sheet form of the hemostatic material. 同样地，在肿瘤手术中，特别是肝脏手术中，优选采用片状形式或海绵形式的止血材料， 将其放置在瘤床内或瘤床上来控制渗血。 Likewise, in oncological surgery, especially the liver surgery, preferably using a sheet form or sponge form of the hemostatic material, which is placed within the tumor bed, or tumor bed to control oozing. 在皮肤病应用中，优选片状形式。 In dermatological applications, a sheet form is preferred. 在血管闭合穿刺时，通常优选蓬松物形式。 When closed vessel puncture, puff form is generally preferred. 在某些应用中优选诸如微缝合或大缝合的缝合线形式。 In certain preferred applications, such as micro-stitching or sutures in the form of large suture. 虽然所述不同形式在递送和操作特性上各有不同，这些装置可以有效地将止血剂施加在作用位点，并通过血小板粘附、血小板活化和血液凝结迅速引发止血栓塞的形成。 Although the different forms differ in the delivery and operational characteristics of these devices may be effectively applied to the hemostatic agent site of action, and through platelet adhesion, platelet activation and blood clotting rapidly initiate hemostatic plug formation. 在优选实施方案中，使用包括壳聚糖纤维的止血剂。  In a preferred embodiment, the hemostatic agent comprises a chitosan fibers. 诸如可生物吸收的微孔多糖微球的辅助止血剂可沉积在壳聚糖纤维上。 Microporous polysaccharide microspheres auxiliary hemostatic agent such as a bioabsorbable may be deposited on chitosan fibers. 然而，可以使用任何其他适合的辅助止血剂。 However, any other suitable auxiliary hemostatic agent. 甲壳质和壳聚糖都是无毒的，但与甲壳质相比，由于壳聚糖在酸溶液中具有更好的溶解性，因此在医疗和制药领域中应用更为广泛。  The chitin and chitosan are non-toxic, but compared with chitin, since the chitosan has better solubility in an acid solution, so in the medical and pharmaceutical fields applied more widely. 壳聚糖具有良好的生物相容性，并且可被脱乙酰壳多糖酶、木瓜蛋白酶、纤维素酶和酸性蛋白酶生物降解。 Chitosan has biocompatible and may be chitosan, papain, cellulase, and acid protease biodegradation. 壳聚糖显示出抗炎和镇痛作用，并促进止血和伤口愈合。 Chitosan exhibits anti-inflammatory and analgesic effects, and promotes hemostasis and wound healing. 壳聚糖还在手术治疗和伤口保护中用作止血剂。 Chitosan also surgical treatment and wound protection as hemostats. 美国专利第4，394，373号公开了壳聚糖的止血作用。 US Patent No. 4,394,373 discloses a hemostatic effect of chitosan. 可采用单一的止血基质或止血基质的组合。  can be a single hemostatic substrate or combination of hemostatic substrate. 优选不同的基质形式，例如蓬松物、毛绒、织物、片、海绵、缝合线或粉末。 Preferably the matrix of different forms, e.g. puff, fleece, fabric, sheet, sponge, suture, or powder. 在本说明书中，术语“毛绒”根据其通常的意思被用作广义的术语并且包括任何处理为柔软的、有延展性的或类似的纤维材料。 In the present specification, the term "pile" is used as a broad term in accordance with its ordinary meaning and includes any treatment of a soft, malleable or the like fibrous material. 提供的毛绒不限于无纺或纺织织物形式或蓬松物、球或片的形式。 Plush provided is not limited to nonwoven or woven fabric form or in the form of fluff, spheres or tablets. 可以理解，使用任何合适的方法处理或涂布纤维毛绒以加强其亲水性和/或其止血性质。 It will be appreciated, any suitable method of pile fibers treated or coated to enhance its hydrophilicity and / or its hemostatic properties. 术语“蓬松物”根据其通常的意思被用作广义的术语并且包括任何设置为软球或衬垫的纤维材料。 The term "fluff" is used as a broad term in accordance with its ordinary meaning and includes any set soft ball or pad of fibrous material. 可以使用毛绒构成蓬松物。 It can be configured using plush fluff. 术语“海绵”根据其通常的意思被用作广义的术语并且包括配置为吸收诸如血液的液体的材料。 The term "sponge" is used as a broad term in accordance with its ordinary meaning and is configured to include a liquid absorbent material such as blood. 可以单独使用但不限于毛绒、蓬松物、纤维、织物等或与另一材料组合使用构成海绵。 It may be used alone, but are not limited to plush, puff, fiber, fabric or the like or in combination with other materials in the sponge. 可采用不同基质形成材料的均勻混合物，或者可从两种或更多种不同组成的基质制备复合基质。 Using different matrix materials to form a homogeneous mixture, or a composite matrix may be prepared from two or more different composition matrix. 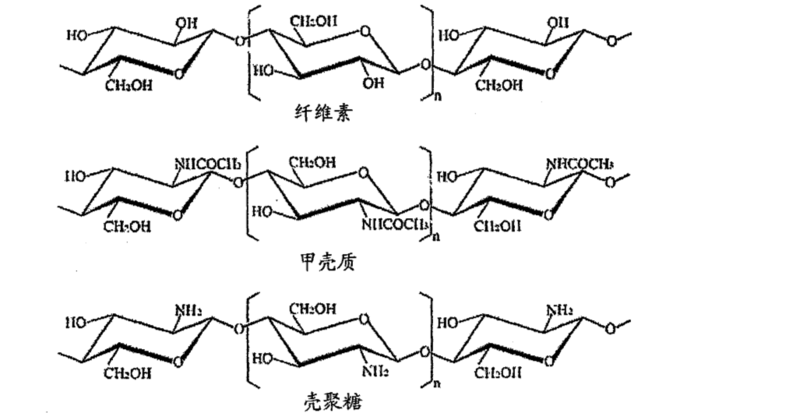 优选的复合物包括壳聚糖和胶原。 Preferred composite comprises chitosan and collagen. 用于制备壳聚糖毛绒的甲壳质的特别优选的来源是蟹壳。  for the preparation of chitosan fleece particularly preferred source of chitin is crab. 从蟹壳制备的甲壳质通常显示比从虾壳制备的甲壳质更高的分子量。 Chitin prepared from crab shell chitin generally exhibit higher than molecular weights prepared from shrimp shells. 蟹壳甲壳质通常还显示比虾壳甲壳质更高的脱乙酰度。 Crab chitin than shrimp chitin also generally show a higher degree of deacetylation. 蟹壳甲壳质通常显示约600，000至130万道尔顿的平均分子量。 Crab shell chitin usually show about 600,000 to 1.3 million Daltons. 脱乙酰度通常高于90%，其可以促成观察到更高的分子量。 Degree of deacetylation is generally higher than 90%, which may contribute to a higher molecular weight was observed. 用于制备壳聚糖纤维的优选壳聚糖具有高于约600、650、700、750、800、850、900、 950、1000、1100、1200、1300、1400 或1500kDa 或更高的分子量；更优选从约600、650、700、 750、800、925、850、875、900、925、950、975、1000、1025、1050 或1075kDa 至约1500kDa ；最优选从约1100、1125、1150、1175、1200、1225、1250 或1275kDa 至约1300、1325、1350、1375、 1400、1425、1450 或1475kDa。  Chitosan used to prepare the chitosan fibers preferably having a greater than about 600,650,700,750,800,850,900, 950,1000,1100,1200,1300,1400 or higher or 1500kDa molecular weight; more preferably from about 600,650,700, 750,800,925,850,875,900,925,950,975,1000,1025,1050 to about 1500 kDa or 1075kDa; most preferably from about 1100,1125,1150 , 1175,1200,1225,1250 or 1275kDa to about 1300,1325,1350,1375, 1400,1425,1450 or 1475kDa. 壳聚糖优选具有约90、91、92、93、94、95、96、97、98 或99%或更高的脱乙酰度，更优选从约90. 0,90. 5,91. 0、91. 5或92. 0%至约92. 5,93. 0,93. 5,94. O、94. 5 或95. 0%。 Chitosan preferably about 90,91,92,93,94,95,96,97,98, or 99% deacetylation degree or more, and more preferably from about 90. 0,90. 5,91. 0, 91.5 or 92.0% to about 92. 5,93. 0,93. 5,94. O, 94. 5, or 95.0%. 虽然通常优选采用壳聚糖作为基质，但也可应用其它适合的基质。  While it is generally preferred to use chitosan as a matrix, but may also be applied to other suitable substrates. 这些基质优选为可制成所需形式（例如，纤维、海绵、基体、粉末、片、缝合线和/或蓬松物）的可生物吸收的亲水性材料。 The matrix is ​​preferably a hydrophilic material that can be formed into a desired form (e.g., a fiber, a sponge, matrix powder, sheet, suture, and / or fluff) is bioabsorbable. 其它适合的基质包括合成的乙交酯和丙交酯的可吸收的共聚物。  Other suitable substrates include synthetic absorbable copolymer of glycolide and lactide. 这种共聚物以VICRYL™(Johnson&Johnson in Somerset，NJ 的Ethicon 分公司生产的Polyglactin 910) 的商品名销售。 This copolymer VICRYL ™ (Johnson & Johnson in Somerset, NJ branch of Ethicon produced Polyglactin 910) in sales of goods. 其通过酶水解降解而被吸收。 Which is absorbed by enzymatic hydrolysis degradation. 明胶海绵是用于静脉或渗血性出血的手术过程中的可吸收的止血海绵。  The gelatin sponge is absorbable hemostatic sponge for intravenous or oozing bleeding during surgery. 该海绵粘附在出血位点，并可以吸收约45倍于其本身重量的流体。 The sponge adheres to the bleeding site and absorbs approximately 45 times its own weight of the fluid. 由于该明胶海绵的均勻的多孔性，血小板被捕获在其孔中，激活了凝血级联。 Since this gelatin sponge uniform porosity, platelets are trapped in the pores, the coagulation cascade is activated. 可溶性纤维蛋白原转化为不溶性纤维蛋白的网络，其使出血停止。 Soluble fibrinogen into insoluble fibrin network, which stop the bleeding. 当植入组织内时，该明胶海绵在3-5周内被吸收。 When implanted within the tissue, the gelatin sponge is absorbed in 3-5 weeks. 聚乙醇酸也是适合用作基质的合成可吸收聚合物。  polyglycolic acid are also suitable as matrix synthetic resorbable polymer. 由于其较强的水解敏感性，聚乙醇酸在植入后几个月内被吸收。 Because of its strong susceptibility to hydrolysis, polyglycolic acid is absorbed within a few months after implantation. 聚交酯由乳酸的环二酯（丙交酯）通过开环聚合反应制备。  polylactide from lactic acid prepared by reacting a cyclic diester (lactide) by ring-opening polymerization. 乳酸以两种光学异构体或对映异构体的形式存在。 Lactic acid or exist as enantiomers in two optical isomers. 天然存在的是L-对应异构体，而D，L消旋混合物来自乳酸的合成制备过程。 Is a naturally occurring L- diastereomers, and D, L racemic mixture derived from lactic acid prepared during the synthesis. 拉伸时，由衍生自L-对映异构体的聚合物纺成的纤维具有较高的结晶度，而衍生自消旋混合物的纤维是无定形的。 Stretching, a polymer derived from L- enantiomer spun fibers have higher crystallinity, and the fiber derived from the racemic mixture is amorphous. 结晶性的聚-L-丙交酯与无定形的DL形式相比，通常更耐水解降解，可用柠檬酸三乙酯增塑化而增加，然而所得产物的结晶性较低而柔韧性较高。 Crystalline poly-lactide -L- compared to a DL amorphous form, more typically hydrolytic degradation, triethyl citrate plasticized available increases, however, the crystallinity of the resulting product is low and a high flexibility . 与其它可生物吸收的材料相比，聚-L-丙交酯被肌体吸收所需的时间相对较长。 Compared with other bioabsorbable materials, -L- poly lactide time required for absorption by the body is relatively long. 可以制备高分子量的聚-L-丙交酯聚合物并得到具有高抗拉强度的纤维。 -L- poly-lactide polymer can be produced and to obtain a high molecular weight fibers having a high tensile strength. 聚（丙交酯-共-乙交酯）聚合物也是适合的基质。  Poly (lactide - co - glycolide) polymers are also suitable substrates. 包含约25到约70摩尔百分比的乙交酯的共聚物通常是无定形的。 Glycolide copolymer comprises from about 25 to about 70 mole percent is generally amorphous. 纯聚乙交酯约为50%结晶性，而纯聚-L-丙交酯约为37%结晶性。 Pure polyglycolide about 50% crystallinity, while pure poly-lactide -L- about 37% crystallinity. 可将聚二噁烷酮制成纤维来形成合适的基质。  polydioxanone may be formed into fibers suitable substrate. 由e_己内酯合成的聚己酸内酯是半结晶性聚合物，其体内吸收非常缓慢。 E_ caprolactone synthesized from polycaprolactone is a semi-crystalline polymer, which is very slowly absorbed in vivo. 由25% e-己内酯和75% L-丙交酯制备的e_己内酯和L-丙交酯共聚物是弹性的，而由10% e-己内酯和90% L-丙交酯制备的是刚性的。 Preparation of ester and 25% e- caprolactone of 75% L- lactide and caprolactone e_ L- lactide copolymer is elastic, while the 10% e- caprolactone and 90% L- prop preparing lactide is rigid. 聚_b-羟丁酸酯是天然存在的可生物降解的聚合物，并易于在体外合成，并可熔化加工。 _B- poly-hydroxybutyrate is a naturally occurring biodegradable polymer, and readily synthesized in vitro, and melt processing. 与纯的聚_b-羟丁酸酯相比，羟丁酸酯和羟戊酸酯的共聚物表现出更快的降解。 _B- compared to pure poly-hydroxybutyrate, hydroxybutyrate and hydroxyvalerate copolymer exhibits faster degradation. 含羟乙酸酯链的可吸收的合成聚酯是合适的基质。  Synthesis of the polyester chains containing glycolate are suitable resorbable matrix. 也可使用用二噁烷酮替代乙交酯制备的类似共聚物，聚氨基酸也可使用。 Alternatively the copolymer may also be used similar to the preparation of esters with glycolide polydioxanone, polyamino acids may also be used. 肠线、硅化处理的肠线及含铬的肠线在某些实施方案中适合用作为基质。  gut, gut and siliconized chromium catgut In certain embodiments for use as a matrix. 然而，由于合成材料通常具有可预测的性能及较低的炎性反应，因此与天然材料相比，更为优选。 However, because synthetic materials generally have a low and predictable performance of the inflammatory response, as compared with natural material, it is more preferable. 在某些实施方案中，需要向优选实施方案的壳聚糖纤维止血剂中加入辅助的止血剂。  In certain embodiments, the need to add an auxiliary hemostatic agent to the chitosan fibers hemostatic agents of preferred embodiments. 可将任何适合的止血剂沉积在优选实施方案的基质上。 Any suitable hemostatic agent can be deposited on a substrate in a preferred embodiment. 然而，在特别优选的实施方案中，所述止血剂包含生物可吸收的微孔多糖微球（例如由Waukesha，WI的Emergency Medical Products, Inc.销售的TRAUMADEX™)。 However, in a particularly preferred embodiment, the hemostatic agent comprises microporous polysaccharide microspheres bioabsorbable (e.g. by the Emergency Medical Products Waukesha, WI's, Inc. sold TRAUMADEX ™). 所述微球具有微重复多孔渠道。 The porous microspheres having a repeated micro channel. 该微球的孔大小能使水吸收和血液中的白蛋白、凝血因子和其它蛋白和细胞组分的超浓缩。 The pore size of the microspheres and make the water absorption of super-concentrated blood albumin, coagulation factors and other proteins and cellular components. 该微球还影响了血小板的功能，并促进纤维蛋白的形成。 The microspheres also affect platelet function and promotes the formation of fibrin. 此外，该微球似乎加速了凝血作用的酶反应速率。 In addition, microspheres appears to accelerate the coagulation enzymatic reaction rate effect. 当通过直接、加压应用到活跃出血伤口时，颗粒充当分子筛来从血液中提取液体。 When directly, apply pressure to the active bleeding wound, the particles act as molecular sieves to extract fluid from the blood. 该颗粒控制的多孔性可排除血小板、血红细胞和大于25，OOO道尔顿的血清蛋白，随后这些物质在所述颗粒的表面浓缩。 The porous particles can be controlled to exclude platelets, red blood cells and greater than 25, OOO daltons serum proteins, and then these were concentrated in the surface of the particles. 这种分子排阻特性在颗粒表面产生了高浓度的血小板、凝血酶、纤维蛋白原和其它蛋白，产生了成凝胶作用。 This produces a characteristic molecular exclusion high concentration of platelets, thrombin, fibrinogen, and other proteins on the particle surface, resulting in a gel effect. 所述凝胶化的聚集的细胞和组分加速了正常的凝固级联反应。 Cells and the gelling component of accelerated aggregation normal coagulation cascade. 该密集的蛋白-细胞基质内产生的纤维蛋白网络紧密地粘连到周围的组织。 The dense proteins - the fibrin network produced extracellular matrix closely adhered to the surrounding tissue. 所述成凝胶过程在几秒内开始，而所得凝块异常坚韧，通常与所述微粒一起破碎。 The process begins in a gel within seconds and the resulting abnormal clot tough, usually together with the crushed particles. 优选实施方案中可采用的其它适合的止血剂包括但不限于凝固因子浓缩物、 重组因子VIIa(N0V0SEVEN ® ) ；alphanate FVIII 浓缩物；bioclate FVIII 浓缩物； monoclate-P FVIII 浓缩物；haemate P FVIII ;vonWiIlebrand 因子浓缩物；helixate FVIII 浓缩物；hemophil-M FVIII 浓缩物；humate-P FVIII 浓缩物；hyate-C ® Porcine FVIII 浓缩物；koate HPFVI11 浓缩物；kogenate FVIII 浓缩物；recombinate FVIII 浓缩物；mononine FIX浓缩物和fibrogammin P FXIII浓缩物。  Other suitable hemostatic agent can be employed in the preferred embodiment include but are not limited to coagulation factor concentrates, recombinant Factor VIIa (N0V0SEVEN ®); alphanate FVIII concentrate; bioclate FVIII concentrate; monoclate-P FVIII concentrate; haemate P FVIII; vonWiIlebrand factor concentrates; helixate FVIII concentrate; hemophil-M FVIII concentrate; humate-P FVIII concentrate; hyate-C ® Porcine FVIII concentrate; koate HPFVI11 concentrate; kogenate FVIII concentrate; recombinate FVIII concentrate ; mononine FIX concentrate and fibrogammin P FXIII concentrate. 这类止血剂可以任何适合的形式（粉末、液体、纯化形式、位于适合赋形剂中、位于适合支持物上等等）应用到所述基质。 Such hemostatic agents can be in any suitable form (powder, liquid, purified form, located in suitable excipients, is located on a suitable support, etc.) applied to the matrix. 1. 8 ： 1,1. 9 ： 1、2 ： 1 或更高。 1.8: 1, 9: 1, 2: 1 or higher. 通常优选在止血支持物上（例如壳聚糖纤维)沉积辅助止血剂（例如微孔多糖微球）以生产用于出血或渗血伤口的止血材料。  The support is generally preferably in hemostasis (e.g. chitosan fibers) deposition aid hemostat hemostatic material (such as microporous polysaccharide microspheres) is used to produce a bleeding or oozing wound. 然而，在某些实施方案中，可以将壳聚糖纤维作为有效的止血材料使用而不添加另一止血剂。 However, in certain embodiments, without the addition of chitosan fibers can be further used as a hemostatic agent effective hemostatic material. 例如，如下所述但没有加入微孔多糖微球的壳聚糖蓬松物用于出血或渗血伤口时为特别有效的止血材料。 For example, as described below but without microporous polysaccharide microspheres were added chitosan puff for bleeding or oozing wound is a particularly effective hemostatic material. 在某些实施方案中，此处描述的各种壳聚糖形式（织物、海绵、缝合线、纤维等）当不使用辅助剂时也是有效的止血材料。 In certain embodiments, the various forms of chitosan (fabric, sponge, suture, fiber, etc.) when no adjuvant is also effective hemostatic material described herein. 止血支持物的优选形式依赖于其应用。 The preferred form of the hemostatic support depends on its application. 止血蓬松物或毛绒是特别优选的形式，其中所述基质包括纤维、棉花样材料的蓬松物，其可处理为适合的形状或大小以适应具体的伤口结构。  The hemostatic puff or plush is a particularly preferred form, wherein the substrate comprises fibers, like cotton fluff material which can be processed to a suitable shape or size to suit a particular wound configuration. 图1提供壳聚糖毛绒的扫描电子显微照片图像。 Figure 1 provides a chitosan fleece scanning electron micrograph image. 在优选的实施方案中，以如下方式由壳聚糖纤维制备蓬松物。 In a preferred embodiment, the fluff was prepared in the following manner from chitosan fibers. 将根据常规方法制备的壳聚糖纤维撕或切（手动或用机械装置）成片，将所述片平整并层叠在一起。 Chitosan fibers torn or cut (by hand or mechanical means), prepared according to conventional methods into a sheet, the flat sheet and laminated together. 将乙酸溶液、冰醋酸或其它酸性溶液（PH值优选3.0至4. 5)喷在第一层上使壳聚糖纤维彼此紧固，借此形成网状结构。 The acetic acid solution, glacial acetic acid or other acidic solution (PH value is preferably 3.0 to 4.5) was sprayed on the first layer of chitosan fibers fastened to each other, thereby forming a network structure. 用冰醋酸喷洒壳聚糖毛绒或纤维形成水溶性壳聚糖铵盐。 Forming a water soluble chitosan salt with acetic acid spray chitosan fleece or fibers. 铵盐形式的壳聚糖与未处理的壳聚糖毛绒或纤维相比，对潮湿组织具有增强的生物粘附性和增强的止血效果。 Ammonium salts of chitosan as compared to untreated chitosan fleece or fibers with enhanced bioadhesive properties and enhanced hemostatic effect on damp tissue. 喷洒在壳聚糖毛绒或纤维上的希望浓度的乙酸可以作为“胶水”将纤维粘附在一起，将微孔多糖微球粘附在纤维上，或者更好地将壳聚糖毛绒粘附在诸如血液或体液的潮湿组织上。 Sprayed onto chitosan fleece or fibers desired concentration of acetic acid may be used as "glue" the fibers adhered together, microporous polysaccharide microspheres to adhere to the fibers or the chitosan fleece adhered better attached to body fluids such as blood or tissue moist. 任选地，如微孔多糖微球的粉末形式的辅助剂，可以喷雾在第一壳聚糖纤维层上，然后将另一壳聚糖纤维层置于其上。  Optionally, in powder form such as microporous polysaccharide microspheres adjuvants can be sprayed on the first chitosan fiber layer, and then the other placed on top of chitosan fiber layers. 随后重复所述沉积过程（酸溶液之后沉积微孔多糖微球），建立所需水平的层。 The deposition process is then repeated (after depositing microporous polysaccharide microspheres acid solution), to establish the desired level layer. 可将适量的粉末形式剂加入到纤维层以产生包含直到约50、60、 70、80或90%重量比或更高的辅助剂的蓬松物。 The amount may be in powder form is added to the fiber layer to produce up to about 50, 60, 70, 80 or fluff or more than 90% by weight of adjuvants include. 如果辅助剂以粉末形式加入，最适负载水平依赖于采用的辅助剂的应用和类型。 If the adjuvant is added in powder form, the optimal loading level depends on the application and type of adjuvant used. 通常优选不向上层加入辅助剂或其他粉末物质，但是在某些实施方案中希望添加。 Or other adjuvants usually preferred powder material is not added to the upper layer, but wish to add certain embodiments. 通过选择总层数可得到纤维的优选厚度。 Preferred thickness of the fiber can be obtained by selecting the total number of layers. 在烘箱中真空干燥所得止血材料生产止血蓬松物。  The resulting vacuum dried in an oven hemostatic material production hemostatic puff. 虽然通常优选使用冰醋酸或乙酸溶液，但同样也可使用具有类似PH值或类似性质的其它酸溶液。 While it is generally preferred to use acetic acid or acetic acid, but also using other similar acid solution having a PH value or similar properties. 例如，适于使用的可为乳酸、柠檬酸、羟乙酸和弱酸的混合物。 For example, it may be suitable for use lactic acid, citric acid, glycolic acid and mixtures of weak acids. 同样，也可使用任何生物相容的壳聚糖溶剂液体，例如纯水、乙醇溶液等。 Likewise, chitosan can be any biocompatible liquid solvent, such as purified water, ethanol solution and the like. 这样的溶液可以是酸性的、碱性的或中性的。 Such solutions may be acidic, basic or neutral. 在某些实施方案中，优选使用非酸性的溶液。 In certain embodiments, preferred non-acidic solution used. 在这类实施方案中，可采用在壳聚糖纤维间提供粘合的适合形式的另一材料，例如明胶、淀粉、角叉菜胶、古尔胶、胶原、果胶等等。 In such embodiments, the material may be used to provide other suitable form of bonding between chitosan fibers, such as gelatin, starch, carrageenan, guar gum, collagen, pectin and the like. 虽然壳聚糖是制备止血蓬松物的优选基质，其它纤维基质，特别是纤维多糖基质也适合使用。 Although the chitosan matrix is ​​preferably prepared hemostatic puff, other fiber matrix, in particular a polysaccharide matrix fibers are also suitable for use. 通过调节壳聚糖纤维的水分水平，可优化纤维间的粘附性和任选辅助剂负载容量。  By adjusting the moisture level of chitosan fibers can be optimized and optionally adjuvants adhesion between the load capacity of the fibers. 纤维中该液体辅助所述纤维将相互并粘附到相容的辅助剂。 The fibers of the liquid secondary fibers will adhere to each other and compatible adjuvants. 还可通过采用较薄的纤维增加负载容量。 Also increase the load capacity by using thinner fibers. 所述纤维可具有均一的厚度，也可具有多种厚度。 The fibers may have a uniform thickness, and may have a variety of thicknesses. 更薄的纤维可更牢固地粘附到动脉、静脉或其它伤口。 Thinner fibers can more firmly adhere to the artery, vein or other wound. 在制备包含负载了微孔多糖微球的壳聚糖纤维的止血蓬松物时，通常优选所得蓬松物含有从约0. 1 %至约95 %重量比的微孔多糖微球，更优选从约1至约60、65、70、75、80、 85,90或95%重量比的微孔多糖微球，最优选从约5、10、15、20或25%重量比至约30、35、 40、45、50或55%重量比的微孔多糖微球。  In preparing chitosan fiber comprising a supported microporous polysaccharide microspheres hemostatic puff, puff generally preferred resultant microporous polysaccharide microspheres comprising from about 0.1% to about 95% by weight, more preferably from about 1 to about 60,65,70,75,80, 85, 90 or 95% by weight of the microporous polysaccharide microspheres, and most preferably from about 15, 20 or 25% by weight ratio of from about 30 to , 35, 40,45,50, or 55% microporous polysaccharide microspheres by weight. 然而，在某些实施方案中，可优选更高或更低水平的微孔多糖微球。 However, in certain embodiments, higher or lower level may be preferably microporous polysaccharide microspheres. 如果使用不同的止血剂，或需将其它组分加入所述壳聚糖纤维或其它纤维基质中时，可优选不同的负载水平。 If a different hemostatic agent, or other components need to be added to the chitosan fibers or other fibers when the matrix, different loading levels can be preferred. 为了制备具有改善伸延性的止血壳聚糖蓬松物，可将聚乙烯醇（PVA)加入酸性溶液中。  To prepare the Chitosan hemostatic puff having improved expandability, and may be polyvinylalcohol (PVA) added to the acidic solution. 含有2%重量比PVA的乙酸溶液产生弹性加强的止血蓬松物，但是蓬松物亲水性减弱。 Containing 2% by weight of reinforcing elastically hemostatic puff acetic acid than a solution of PVA, but weakened hydrophilic fluff. 通常优选高亲水性以确保止血蓬松物牢固地粘附伤口。 It is generally preferred to ensure high hydrophilicity hemostatic puff strongly adhere the wound. 然而，在某些实施方案中，也可相对少量地降低亲水性，这并不严重影响蓬松物粘附伤口的能力。 However, in certain embodiments, may be a relatively small amount of hydrophilic reduced, this does not seriously affect the ability of fluff adhering the wound. 借助以下修改，可根据上述用于制备止血蓬松物的方法由壳聚糖纤维和微孔多糖微球制备止血织物。  by means of the following modifications may be made fibers and chitosan hemostatic microporous polysaccharide microsphere fabric prepared according to the above method for preparing a hemostatic puff. 将任选负载有辅助剂的一层或更多层壳聚糖纤维压平并真空干燥。 The adjuvant is optionally loaded with one or more layers of chitosan fiber flattened and dried in vacuo. 通常优选使用2、3、4、5、6、7、8、9或10层或更多层的壳聚糖纤维制备织物。 Generally preferred to use 9 or 10 or more layers of chitosan fiber woven fabric is prepared. 通常优选所述织物的一侧具有平滑的表面，而织物的另一侧具有粗糙表面（例如，对于壳聚糖，在加热期间向纤维层表面上施用TEFLON™表面得到平滑表面，而向纤维层表面应用隔离纸得到粗糙表面）。 Side of the fabric is generally preferably has a smooth surface, while the other side of the fabric with a rough surface (e.g., for chitosan, administration TEFLON ™ surface to obtain a smooth surface of the upper surface of the fiber layer during the heating, and the fiber layer application of the surface of the release paper to give a roughened surface). 然而，在某些实施方案中，优选具有两侧粗糙侧的织物，例如，用于连接不规则伤口，或者诸如致命的腹股沟损伤的较深的伤口。 However, in certain embodiments, preferably having a rough side of both sides of the fabric, for example, for connecting an irregular wound, or a lethal groin injury such deep wounds. 在优选的实施方案中，将所述粗糙表面暴露于伤口，以使壳聚糖纤维与伤口的接触最大化，以对伤口产生改进的止血效果和对伤口更好的粘附。 In a preferred embodiment, the roughened surface is exposed to the wound so that the chitosan fibers maximize contact with the wound to the wound resulting in an improved hemostatic effect and better adhesion to the wound. 在制备包含负载有微孔多糖微球的壳聚糖织物的止血织物时，通常优选所得织物含有从约0. 01至约75%重量比微孔多糖微球，更优选从约1至60%重量比微孔多糖微球，最优选从约5、10、15、20或25%重量比至约30、35、40、45、50或55%重量比微孔多糖微球。 In preparing chitosan hemostatic fabric comprising a fabric loaded with microporous polysaccharide microspheres, typically resulting fabric preferably comprises from about 0.01 to about 75% by weight of the microporous polysaccharide microspheres, more preferably from about 1-60% microporous polysaccharide microspheres by weight, most preferably from about 15, 20 or 25% by weight to about 55% by weight or 30,35,40,45,50 microporous polysaccharide microspheres. 然而，在某些实施方案中，可优选更高或更低水平的微孔多糖微球，或甚至根本没有微球。 However, in certain embodiments, higher or lower level may be preferably microporous polysaccharide microspheres, or even no microspheres. 如果使用不同的止血剂，或将其它组分加入所述壳聚糖纤维或其它基质中，可优选不同的负载水平。 If a different hemostatic agent, or other components added to the chitosan fibers or other substrate may be preferably different load levels. 所述止血织物可以预定尺寸的片形式提供。 The  hemostatic fabric sheet in the form of a predetermined size may be provided. 任选地，可对大片的止血织物进行切害I]、修剪或折叠，以提供适合所述伤口的尺寸和形状。 Optionally, the hemostatic fabric may be made to cut large damage the I], trim or folded to provide a suitable size and the shape of the wound. 虽然所述止血织物是生物可吸收的， 但是在皮肤或局部应用中，优选在获得满意的止血程度后将其从所述伤口移除，或将其留在原位直到伤口痊愈。 Although the hemostatic fabric is bioabsorbable, but the skin or topical application, preferably removed from the wound after a satisfactory degree of hemostasis, which will remain in place, or until the wound healed. 止血织物可用作人造皮肤，和/或提供抗菌性质。 Hemostatic fabric can be used as artificial skin, and / or provide antimicrobial properties. 当将所述止血剂用于体内应用时，优选将其留在原位，由身体随时间吸收。 When the hemostatic agent for in vivo applications, it is preferably left in place, absorbed by the body over time. 这类止血织物特别适合应用于处理诸如癌床中或脑组织的渗血性伤口。 Such hemostatic fabric particularly suitable for treatment of bleeding wounds such as cancer or brain tissue bed. 可根据本领域公知的方法由生物相容或可生物吸收的聚合材料如壳聚糖制备多孔海绵来制备止血海绵。  The compatible biological or bioabsorbable according to the methods known in the art of polymeric materials such as a porous sponge prepared preparing chitosan hemostatic sponge. 这类方法通常涉及制备聚合材料、交联剂和发泡剂的溶液。 Such methods generally involve the preparation of a polymeric material, a crosslinking agent and a blowing agent solution. 所述海绵可在所述制备过程中的任何适当时刻或多个时刻负载止血剂，例如在所述海绵的形成过程中，或在海绵制备后。 The sponge may be prepared in any suitable time during the time of one or more hemostatic agent loads, for example, during formation of the sponge, a sponge, or after preparation. 可将优选实施方案的止血基质制成缝合线。  The suture can be made of the preferred embodiment the hemostatic substrate. 在优选实施方案中，将壳聚糖纤维制成微缝合线。 In a preferred embodiment, the chitosan fibers micro suture. 用于缝合线制作的方法包括挤出、熔化纺制、编织及许多其它类似方法。 A method for making a suture include extrusion, melt spinning, weaving, and many other similar methods. 缝合线原材料的合成可通过纺织工业中的许多方法来实现。 Synthetic suture material can be achieved by a number of methods in the textile industry. 缝合线尺寸以代表其直径的数字表示，所述直径以降序排列为从10至1，随后是1-0至12-0，其中10为最大而12-0为最小。 Digital suture size representation to represent the diameter, the diameter in descending order of from 10 to 1, followed by a 1-0 to 12-0, and 12-0 in which a maximum of 10 minimum. 缝合线可包括单丝或许多丝捻合在一起、纺在一起或编织在一起。 The suture may comprise a monofilament or a plurality of strands twisted together, spun together or braided together. 优选实施方案的缝合线表现出令人满意的特性，包括压迫-牵拉关系、拉伸强度、保持率、柔韧性、固有粘度、可湿性、表面形态、降解性、热性质、结的接触角以及弹性。 Suture preferred embodiments exhibit satisfactory properties, including compression - pull relationship, tensile strength, retention, flexibility, intrinsic viscosity, wettability, surface morphology, degradation, thermal properties, contact angle junction and elasticity. 止血缝合线可用于任何适合的应用。 Hemostatic suture may be used in any suitable application. 然而，通常不优选用于血管吻合，因为它的止血性质会造成血管中不希望的血栓的形成。 However, it is generally not preferred for vascular anastomosis, due to its hemostatic properties cause undesirable vascular thrombosis. 优选实施方案的止血基质可成形为粉末，并以此形式直接应用于伤口。 Hemostatic matrix  The preferred embodiments may be formed as a powder and in this form applied directly to the wound. 例如，任选与其它材料组合的壳聚糖颗粒可用作拔牙后的孔隙填充物。 For example, chitosan particles, optionally in combination with other materials may be used as the pore-filling material after extraction. 可由烧结的如壳聚糖颗粒的聚合物颗粒制备三维多孔基体，且药物或治疗剂渗入所述孔中。  The polymer prepared by a sintered three-dimensional porous chitosan particles of the matrix particles, and the drug or therapeutic agent penetrate into the pores. 可选择地，可将包括包裹有药物或治疗剂壳聚糖壳的微囊烧结形成基体。 Alternatively, the package may include a drug or therapeutic agent chitosan microcapsules sintered shell-forming substrate. 虽然通常优选将止血材料（例如上述制备的止血织物、海绵、蓬松物或粉末）直接应用到伤口，并且虽然止血材料对许多类型的伤口具有令人满意的粘附性，然而在某些实施方案中，优选将所述止血材料结合入包括其它组分的伤口敷料中。  While it is generally preferred that the hemostatic material (e.g. hemostatic fabric prepared as described above, sponge, puff, or powder) applied directly to the wound, and while the hemostatic material having satisfactory adhesion to many types of wounds, however, a in some embodiments, the hemostatic material is preferably incorporated into a wound dressing including other components. 为了确保所述止血材料保持粘附于伤口，可例如沿着所述止血织物、海绵或蓬松物的一侧的边缘使用适合的粘合剂。  To ensure that the hemostatic material remains adhered to the wound, for example along a side edge of the hemostatic fabric, sponge or puff using a suitable adhesive. 虽然可使用任何适用于与皮肤形成结合的粘合剂，通常优选使用压敏粘合剂。 While any suitable form a bond with the skin adhesive, it is generally preferred to use a pressure sensitive adhesive. 压敏粘合剂通常定义为当施加轻压时能粘附到基质，但去除后不留下残余物的粘合剂。 The pressure-sensitive adhesive is generally defined as when a light pressure is applied can be adhered to the substrate, but without leaving adhesive residue after removal. 压敏粘合剂包括但不限于含溶剂的溶液粘合剂、热熔粘合剂、水性乳液粘合剂、可压延的粘合剂以及可辐射熟化的粘合剂。 Pressure sensitive adhesives include but are not limited to, a solution of a solvent-containing adhesives, hot melt adhesives, aqueous emulsion adhesives, calenderable adhesive, and radiation-cured adhesives. 由于溶液粘合剂易于应用以及其多功能性，多数应用都优选溶液粘合剂。 Since the adhesive is easy to apply the solution and their versatility, most preferably a solution of an adhesive applications. 热熔粘合剂通常基于树脂-增粘的嵌段共聚物。 Block copolymers tackified - usually a hot melt adhesive based resin. 水性乳液粘合剂包括那些由丙烯酸共聚物、丁二烯苯乙烯共聚物和天然橡胶乳胶制备的粘合齐U。 Homogeneous aqueous emulsion adhesives include those derived from acrylic acid copolymer adhesive, a butadiene-styrene copolymer and a natural rubber latex produced U. 可辐射熟化的粘合剂通常由丙烯酸低聚物和单体构成，其通过暴露于紫外光熟化后形成压敏粘合剂。 The radiation curable adhesive was typically made of an acrylic oligomers and monomers, which form the pressure-sensitive adhesive by exposure to ultraviolet light curing. 压敏粘合剂中最常用的弹性体包括天然橡胶、苯乙烯_ 丁二烯乳胶、聚异丁烯、丁基橡胶、丙烯酸树脂和硅酮。  The pressure-sensitive adhesives most commonly used elastomers include natural rubber, styrene-butadiene latex _, polyisobutylene, butyl rubber, and silicone acrylic resins. 在优选实施方案中，使用以丙烯酸聚合物或硅树脂为基础的压敏粘合剂。 In a preferred embodiment, the pressure sensitive adhesive acrylic polymer or silicone based. 丙烯酸聚合物通常具有低水平的致过敏性，可从皮肤干净地清除，具有较低的气味，并且表现出较低等级的机械和化学刺激。 Acrylic polymers generally have a low level of allergenicity, can be cleanly removed from the skin, having low odor, and exhibit a lower level of mechanical and chemical irritation. 医疗级的硅酮压敏粘合剂因其生物相容性而优选。 Medical grade silicone pressure sensitive adhesives are preferred for their biocompatibility. 影响在优选实施方案的伤口敷料中应用的压敏粘合剂适用性的因素，包括不含皮肤刺激性组分、足够的粘着强度以使所述粘合剂可干净地从皮肤移除、能适应皮肤的运动而无过度的机械性皮肤刺激以及对体液的良好耐受性。 The pressure-sensitive adhesive applicability Factors  Effects of wound dressing applied in the preferred embodiment, the component comprises a free skin irritation, sufficient cohesive strength such that the adhesive can be cleanly removed from the skin in addition, the skin can accommodate movement without excessive mechanical skin irritation, and good resistance to body fluids. 在优选的实施方案中，所述压敏粘合剂包含丙烯酸丁酯。  In a preferred embodiment, the pressure sensitive adhesive comprises a butyl acrylate. 虽然，通常对许多应用优选丙烯酸丁酯压敏粘合剂，但是可使用任何适用于结合皮肤的压敏粘合剂。 Although, for many applications generally preferably butyl acrylate pressure sensitive adhesive, but may be used in connection with any pressure sensitive adhesive suitable for skin. 这类压敏粘合剂是本领域公知的。 Such pressure sensitive adhesives are known in the art. 如上所述，优选实施方案的止血材料通常对伤口显示出良好的粘附性，因而通常不必使用例如压敏粘合剂的粘合剂。  As described above, the hemostatic materials of preferred embodiments generally exhibit good wound adhesion and thus is typically not necessary to use an adhesive such as pressure sensitive adhesives. 然而，为了便于使用以及确保应用于伤口后所述止血材料保持在固定的位置，优选使用压敏粘合剂。 However, for ease of use and to ensure that the hemostatic material remains after application to the wound in a fixed position, preferably a pressure sensitive adhesive. 虽然优选实施方案的止血织物和其它止血材料通常显示出良好的机械强度和伤口保护性，但是在某些实施方案中，优选在所述止血材料的一侧使用支持材料或其它材料。  While the preferred embodiment the hemostatic fabrics and other hemostatic materials generally exhibit good mechanical strength and wound protection, in certain embodiments, is preferably used to support or other material on one side of the hemostatic material. 例如，可制备包括两层或更多层的组合物，其中这些层中之一为止血材料，而另一层例如为弹性体层、薄纱、蒸汽透过性膜、防水膜、纺织或无纺织物、网等等。 For example, can be prepared a composition comprising two or more layers, wherein one of the layers is the hemostatic material and another layer, for example, an elastomeric layer, gauze, vapor-permeable film, waterproof film, a woven or textiles, nets and so on. 然后所述层可用任何适合的方法结合，例如诸如压敏粘合剂、热熔粘合剂、可熟化粘合剂的粘合剂，在例如迭片结构中加热或加压，通过使用缝合、纽扣或其它紧固装置进行物理附着等等。 Then the layer may be incorporated by any suitable method, such as pressure-sensitive adhesives, hot melt adhesive, curable adhesive binder, for example, heat or pressure lamination by use of stitching, buttons or other fastening means physically attached like. 当将优选实施方案的壳聚糖纤维置于出血或渗血伤口时，其具有止血效果。  When the preferred embodiments chitosan fiber disposed bleeding or oozing wound, having a hemostatic effect. 检测了壳聚糖纤维的物理和化学性质以决定其止血作用的机理并最大化其止血效果。 Detecting the physical and chemical properties of chitosan fiber to determine its role in hemostasis mechanism and maximize hemostatic effect. 当不希望被任何特别的理论束缚，虽然壳聚糖止血功能至今还没有被彻底阐明，但是人们认为在止血中钙含量起重要作用。 While not wishing to be bound by any particular theory, although chitosan hemostatic function has not yet been completely elucidated, it is believed that the calcium content plays an important role in hemostasis. 钙可以刺激血小板释放b-TG、PF-4因子或止血过程中涉及的其它物质。 Calcium can stimulate the release of platelet b-TG, PF-4 other materials or hemostatic factors involved in the process. 测得0.2g壳聚糖样品中（通过脱乙酰作用制备，纯度91. 8%重量比，IOOOkD 分子量）钙含量为0.238 %重量比。  0.2g of chitosan in the sample was measured (91.8% by weight was prepared by deacetylation, purity, IOOOkD molecular weight) calcium content of 0.238% by weight. 通过电感耦合等离子体（ICP)光谱分析仪以及Jarrell-Ash-IlOO ICP-俄歇电子光谱仪（AES)，在1. 6_105Pa的压力下，氩气气氛中测定钙含量。 , 1. 6_105Pa at a pressure of argon atmosphere calcium content was measured by inductively coupled plasma (ICP) spectrometer and Jarrell-Ash-IlOO ICP- Auger electron spectroscopy (AES). 样品制备包括，第一步将壳聚糖纤维溶于浓硝酸。 Sample preparation comprising, a first step is dissolved in concentrated nitric acid chitosan fibers. 溶液保持2小时，然后煮沸将溶液中全部水分蒸发。 Solution was maintained for 2 hours, the solution was then boiled all the water evaporated. 剩余残余物溶于100ml IM硝酸中，然后测定钙含量。 The remaining residue was dissolved in 100ml IM nitric acid, and then determination of calcium content. 文献提示壳聚糖的止血作用可能不遵循上述的凝血级联途径，由于壳聚糖仍可引起去除了所有的血小板、白细胞和血浆的血液的凝聚。 Hemostatic effect  The literature suggests that chitosan may not follow the pathway of the coagulation cascade described above, since chitosan removed all still cause platelets, white blood cells and blood plasma coagulation. 壳聚糖的止血作用最可能源于其引起血红细胞彼此凝结从而形成血块的能力。 Chitosan hemostatic effect is most likely due to its ability to cause erythrocytes to coalesce to each other to form a blood clot. 当壳聚糖纤维与血液接触时，血液渗入壳聚糖纤维形成的网络中。 When chitosan fibers into contact with the blood, which penetrate the network of chitosan fibers. 壳聚糖是亲水性的，并且可润湿形成水凝胶。 Chitosan is hydrophilic and wettable to form a hydrogel. 多孔水凝胶能吸附血细胞或为血细胞提供足够的空间以扩散进入其中。 The porous hydrogels can absorb blood cells or provide sufficient space for the blood to diffuse into the cells therein. 这些因素通过红细胞凝结并形成血栓诱导止血。 These factors erythrocyte by thrombus formation induce hemostasis and coagulation. 另一种假说是壳聚糖作为天然带正电的多糖，可与血蛋白表面的负电荷相互作用，以引起血红细胞彼此凝结。 Another hypothesis is that a natural polysaccharide chitosan are positively charged, negatively charged proteins may interact with the surface of the blood to cause coagulation of red blood cells to each other. 壳聚糖是亲水性的和生物可降解的，并具有生物相容性止血性质。  Chitosan is hydrophilic and biodegradable, and biocompatible hemostatic properties. 它与其他诸如微孔多糖微球材料容易并有效地组合，并在纤维中具有强物理吸附能力和粘附性。 It is easy with other materials, such as microporous polysaccharide microspheres and effectively combined, and having a strong physical adsorption and adhesion of fibers. 壳聚糖还能与微孔多糖微球牢固地键接，这可能是由于它们均基于葡萄糖单元的骨架化学结构的相似性。 Chitosan microporous polysaccharide microspheres also firmly bonded, this may be because they are based on chemical structure similarities backbone glucose units. 壳聚糖对细胞具有强亲和力，借此成为有效的止血材料。 Chitosan has a strong affinity for the cells, whereby an effective hemostatic material. 测定了包含壳聚糖纤维的蓬松物中微孔多糖微球的负载效率。  Determination of loading efficiency fluff comprising chitosan fibers microporous polysaccharide microspheres. 在保持蓬松物的柔韧性时，可实现多至90%的负载效率。 While maintaining the flexibility of puff can load up to 90% efficiency. 当负载效率高于90%时，导致蓬松物变硬，但在某些实施方案中是可接受的。 When the load efficiency greater than 90%, resulting in a fluffy hardens, in certain embodiments, is acceptable. 当壳聚糖纤维负载或结合有其它诸如微孔多糖微球的多糖材料时，可能涉及多种粘附或成键机制。  When the loaded chitosan fibers or other polysaccharide in combination with a material such as microporous polysaccharide microspheres, or may involve a variety of adhesive bonding mechanism. 在一种机制中，在纤维之间、在微孔多糖微球之间、或在微孔多糖微球和壳聚糖纤维之间，静电力维持接触。 In one mechanism, between the fibers, between the microporous polysaccharide microspheres, or between the microporous polysaccharide microspheres and chitosan fibers, electrostatic contact is maintained. 在另一机理中，物理力使颗粒保持在适当的位置，壳聚糖纤维形成支持微孔多糖微球的网格或基质。 In another mechanism, the physical forces keep the particles in place, chitosan fibers forming microporous polysaccharide microspheres support grid or matrix. 在另一机制中，加入壳聚糖纤维和微孔多糖微球的酸性溶液使组分溶解并键合在一起。 In another mechanism, the addition of chitosan fibers and microporous polysaccharide microspheres acidic solution to dissolve the components together and bond. 虽然通过上述三种方法中的任一种（静电力、物理或化学）壳聚糖纤维能相互(或与微孔多糖微球）键合或粘附，通常优选使用两种或更多机制的组合，以产生毛绒的最适负载，例如静电的和物理的、静电的和化学的、物理的和化学的、或静电的和物理的和化学的。  Although by any of the above three methods (electrostatic, chemical or physical) chitosan fibers can be each other (or with microporous polysaccharide microspheres) is bonded or adhered, generally preferred to use two or more combination of multiple mechanisms to produce plush optimal load, such as electrostatic and physical, electrostatic, and chemical, physical and chemical, or electrostatic and physical and chemical. 检测了微孔多糖微球和壳聚糖与水接触后的膨胀。  detecting the microspheres and the swelling after contact with water microporous polysaccharide chitosan. 据观测，纯微孔多糖微球吸收水，并膨胀产生对抗周围结构的压力。 It was observed that pure microporous polysaccharide microspheres absorb water, swell and create a pressure against the surrounding structure. 然而，与水接触时，沉积在壳聚糖纤维蓬松物上的微孔多糖微球在临床上未观测到明显的膨胀。 However, upon contact with water, it is deposited on a chitosan fiber fluff microporous polysaccharide microspheres not observed clinically significant expansion. 所述检测按如下进行：将19g TRAUMADEX™微孔多糖微球置于直径为1. 55cm的装置中，以检测膨胀。 The detection is performed as follows: A 19g TRAUMADEX ™ microporous polysaccharide microspheres apparatus 1. 55cm in diameter was placed in order to detect the expansion. 向所述TRAUMADEX™中加水，导致水吸附。 TRAUMADEX ™ was added to the water, resulting in water adsorption. 向所述装置顶部加重量以防止TRAUMADEX™膨胀。 By weight was added to the top of the device to prevent expansion TRAUMADEX ™. 添加的重量对应接触水后TRAUMADEX™ 产生的压力。 Corresponding to the added weight of the water upon contact pressure generated TRAUMADEX ™. 在该试验中，TRAUMADEX™与水接触前应用的重量与TRAUMADEX™接触水后应用的重量的差值为270g。 In this test, the weight difference between the front contact with water application TRAUMADEXTM ™ ™ water contacts TRAUMADEXTM application by weight of 270g. 因此，TRAUMADEX™接触水后产生的压力为107mmHg。 Thus, the pressure produced upon contact TRAUMADEX ™ water 107mmHg. 采用相同的方法来检测沉积到壳聚糖蓬松物上的TRAUMADEX™的膨胀，但所观测到的体积变化太小而无法检测。 Using the same method to detect deposited on TRAUMADEX ™ expanded chitosan puff, but the observed volume change is too small to detect. 相信，所述多孔壳聚糖蓬松物为所述膨胀的TRAUMADEX™提供了足够的空间，从而与水接触后，无法检测到沉积到壳聚糖蓬松物上的TRAUMADEX™的明显体积变化。 We believed that the porous chitosan puff provides sufficient space for the expanded TRAUMADEX ™, so that after contact with water, can not detect the volume changes significantly deposited on TRAUMADEX ™ chitosan puff. 开发了止血蓬松物，用于与2003年6月16日提交的标题为“血管伤口封闭装置和方法”的同时待审的美国专利申请第10/463，754号中所描述的股动脉穿刺伤口封闭装置结合使用，本发明将该申请内容全文引入作为参考。  developed a hemostatic puff, for the title on June 16, 2003 entitled "The vessel wound closure apparatus and method" while stocks pending U.S. Patent Application No. 10 / 463,754 described arterial puncture wound closure device in conjunction with the present invention, the entire contents incorporated herein by reference. 图2表示用止血蓬松物封闭股动脉穿刺口。 Figure 2 shows a hemostatic puff femoral artery puncture closure. 如图3所示，止血蓬松物包裹在伤口封闭装置的血液指示导管周围，以便被有效和有作用地输送至所述穿刺伤口的上部。 3, hemostatic puff wrap the wound closure device of the indicated blood around the catheter, so as to be effectively delivered to the action and have an upper portion of the puncture wound. 图3描述的血管伤口封闭装置300包括具有在它们之间定义管腔的近端和远端的导管310，可用于将止血蓬松物270放置于穿刺伤口之上。 The vessel wound closure device depicted in Figure 3 comprising 300 having a lumen defined between the proximal and distal ends thereof conduit 310, may be used to hemostatic puff 270 is placed over the puncture wound. 偶合部件320可移动地围绕导管310设置并被配置与停止部件316机械地偶联。 Movably coupling member 320 and 310 is provided with a stop member 316 disposed mechanically coupled around the catheter. 所述装置具有手柄340和手柄362以及输送管350。 The device has a handle 340 and a handle 362 and delivery tube 350. 在特别优选的实施方案中，止血蓬松物任选地与粘附性的或对伤口提供加强的粘附性的其它物质一同通过伤口封闭装置被输送至伤口。 In a particularly preferred embodiment, the hemostatic puff optionally with adhesion or adhesion to other materials to provide a wound reinforcing means are conveyed together to the wound by wound closure. 在静脉破口中，修复所述破口的常规方法包括暂时阻止出血，闭塞该静脉、抽出血液，随后缝合或夹住所述破口以进行修复。 General Method  In a venous laceration, the repair of the break comprises temporarily stopping the bleeding, occluding the venous blood is withdrawn, followed by suturing or clamping said rupture to be repaired. 在常规方法中还需要血管贴片。 In the conventional method needs a blood vessel patch. 优选实施方案的止血织物只需将织物按压在破口处，使其保持原位，并最终被身体吸收，即可用于治疗静脉或动脉破口。 Hemostatic fabric of preferred embodiments only break the fabric is pressed, so as to remain in place, and eventually absorbed by the body, it can be used for the treatment of venous or arterial laceration. 优选实施方案的壳聚糖毛绒特别适合用于与内窥镜或内腔装置、特别是与胃肠应用的内窥镜装置一起使用，以控制出血。  Preferred embodiments of chitosan fleece are particularly suitable for the endoscope or the lumen device, in particular for use with an endoscopic device for parenteral use, to control bleeding. 壳聚糖毛绒可以被制成小的蓬松物，其可插入内窥镜腔以置于伤口之上或处理出血。 Chitosan fleece can be made small puff, which can be inserted into the lumen of the endoscope to be placed over the wound or bleeding process. 例如，直径2mm的壳聚糖毛绒蓬松物，或适合装置腔内径的另一尺寸的蓬松物可通过内窥镜插入并用于控制胃肠或其它出血，例如溃疡、肿瘤或损伤出血，或诸如摘除肿瘤手术过程中的出血。 For example, another size of 2mm diameter lumen diameter of chitosan fleece puff, puff, or suitable means may be inserted through the endoscope and used to control or other gastrointestinal bleeding, ulcers e.g., a tumor or bleeding injury, or such as surgical removal of the tumor during bleeding. 甲壳质以与蛋白和钙盐的组合物的形式存在于甲壳类动物的壳中。  Chitin is present in the form of crustaceans and proteins and calcium compositions shell. 通过从这些壳中去除碳酸钙和蛋白即可获得甲壳质，而通过在强碱溶液中对甲壳质进行脱乙酰化即可产生壳聚糖。 Chitin can be obtained by removing the calcium carbonate and proteins from the shell, through deacetylation of chitin to chitosan produced in the alkali solution. 美国专利第3，533，940号描述了制备壳聚糖的方法，本发明将其全文引入作为参考。 U.S. Patent No. 3,533,940 describes a method for preparing chitosan, the present invention is incorporated by reference in its entirety. 用于从蟹或其它甲壳类动物的壳中获得壳聚糖的优选方法如下。 A preferred method  for obtaining chitosan from crab or other crustacean shells as follows. 通过将所述壳在室温下在稀盐酸中浸泡24小时来除去碳酸钙（脱矿物质）。 Removed calcium carbonate (demineralized) by soaking the shells in dilute hydrochloric acid at room temperature for 24 hours. 随后通过将脱钙的壳用稀氢氧化钠水溶液煮沸6小时来从其中提取蛋白（脱蛋白）。 Followed by boiling with dilute aqueous sodium hydroxide by the decalcified shells 6 hours from the protein extracted therefrom (deproteinization). 所述脱矿物质和脱蛋白步骤优选重复至少两次，以从甲壳类动物的壳中基本去除所有的无机物质和蛋白。 The demineralized and deproteinized steps are preferably repeated at least twice, in order from crustacean shells remove substantially all of the proteins and inorganic substances. 洗涤由此获得的粗甲壳质，随后干燥。 The crude thus obtained chitin was washed, followed by drying. 将甲壳质在强碱溶液中（50%重量比）在140°C加热至少3小时。 The chitin was heated for at least 3 hours at 140 ° C in a strong alkali solution (50% by weight). 在所述碱处理过程中，通过间歇地用水对中间产物进行洗涤，优选两次或更多次，可获得分子链无明显降解的高度脱乙酰化的壳聚糖。 In the alkali treatment process, performed by intermittently intermediate product was washed with water, preferably two or more, can be obtained without significant degradation of the molecular chains of the highly deacetylated chitosan. 图4所示为从虾废物中提取壳聚糖的过程示意图。  Figure 4 is a schematic diagram of the process of extracting chitosan from shrimp waste. 在优选实施方案中，采用湿纺方法来制备壳聚糖纤维。  In a preferred embodiment, the chitosan fibers are prepared using a wet spinning method. 首先，将强聚糖溶解在适合的溶剂中得到第一纺丝溶液。 First, the strong dissolving a first glycan spinning solution in a suitable solvent. 优选的溶剂包括酸性溶液，例如含有三氯乙酸、乙酸、乳酸等等的溶液。 Preferred solvents include an acidic solution, e.g. trichloroacetic acid, acetic acid, lactic acid and the like containing solution. 然而可采用任何适合的溶剂。 However, any suitable solvent may be employed. 对所述第一纺丝溶液进行过滤和脱气，随后将其在压力下通过纺丝喷嘴的孔喷入固化池中。 Said first spinning solution was filtered and degassed before it under pressure through a spinning nozzle hole injection into the cured pool. 从该固化池中回收固体壳聚糖纤维。 The solid was recovered from the solidified pool chitosan fibers. 可对该纤维进行进一步处理，包括但不限于牵拉、洗涤、干燥、后处理、官能化等等。 The fibers can be further processed, including but not limited to drawing, washing, drying, post-treatment functionalization like. 图5所示为制备壳聚糖纤维的设备的示意图。 Figure 5 is a schematic view of apparatus for preparing chitosan fiber. 装置包括溶解罐1、过滤器2、中间罐3、贮罐4、计量泵5、过滤器6、纺丝喷嘴7、固化池8、传感辊9、牵拉池10、牵拉辊11、洗涤池12，以及卷曲辊13。 Apparatus comprising dissolving tank 1, the filter 2, a tundish 3, 4 tank, metering pump 5, a filter 6, a spinning nozzle 7, 8 solidified pool, sensing roller 9, the tank 10 is pulled, the pulling roller 11, sink 12, and the crimping roller 13. 制备适用于制成优选实施方案的止血材料的壳聚糖纤维的优选方法如下。  A preferred method suitable for preparing a hemostatic material of a preferred embodiment of the chitosan fiber is as follows. 通过在混合溶剂温度为5°C的条件下，将3份壳聚糖粉末溶解在含有50份三氯乙酸（TDA)和50份二氯甲烷的混合溶剂中制备了第一壳聚糖纺丝溶液。 Spinning of chitosan by first mixing the solvent temperature is 5 ° C conditions, the powder was dissolved in 3 parts of chitosan containing 50 parts of trichloroacetic acid (TDA) and 50 parts of a mixed solvent of methylene chloride was prepared solution. 将所得第一壳聚糖纺丝溶液过滤，并随后在真空下脱气。 The resulting spinning solution was filtered first chitosan, and then degassed under vacuum. 使用包含14°C的丙酮的第一固化池。 14 ° C containing a first pool of acetone cured. 所述纺丝喷嘴的孔径为0.08mm，孔计数为48，且纺丝速度为lOm/min。 Aperture of the spinning nozzle of 0.08mm, hole count 48, and a spinning speed of lOm / min. 通过用再循环热水加热，使所述纺丝溶液维持在20°C。 By recirculating hot water heating, the spinning solution was maintained at 20 ° C. 从丙酮池中回收壳聚糖纤维，并通过传送带传送到包含15°C的甲醇的第二固化池中。 Chitosan fibers recovered from the acetone bath, and transferred to a second tank containing a cured 15 ° C by the belt methanol. 将纤维在第二固化浴中保持10分钟。 Hold the fibers in the second curing bath for 10 minutes. 回收所述纤维，并随后以9m/min的速度卷绕。 Recovering the fibers, and then at a speed of 9m / min wound. 将卷绕的纤维在0. 3g/l的KOH溶液中中和1小时，随后用去离子水洗涤。 KOH solution at 0. 3g / l and in 1 hour, washed the fiber is then wound with deionized water. 随后将所得壳聚糖纤维干燥，其后该纤维即可制成优选实施方案的止血材料。 Subsequently, the resultant was dried chitosan fibers, after which the fiber can be made into the hemostatic materials of preferred embodiments. 在特别优选实施方案中，实施方案中使用冰醋酸或无水醋酸作为试剂将壳聚糖纤维相互粘附，其中壳聚糖纤维单独或与添加的药剂、治疗剂或其它剂一起用于形成止血剂。  In a particularly preferred embodiment, embodiment or acetic anhydride using glacial acetic acid as reagent chitosan fibers adhere to one another, wherein the chitosan fibers alone or used with the added agent, or other therapeutic agents forming a hemostat. 除在壳聚糖纤维之间提供好的粘附性外，用冰醋酸处理过的纤维对包括动脉或静脉伤口等的伤口还具有优良的粘附性。 In addition to providing good adhesion between the chitosan fibers, the fibers treated with glacial acetic acid also has excellent adhesion to the wounds include wounds such as venous or arterial. 根据应用，可调节溶液中乙酸浓度以提供期望的粘附程度。  Depending on the application, acid concentration in the solution may be adjusted to provide the desired degree of adhesion. 例如，如果采用壳聚糖纤维处理较深的伤口或其它不需要强粘附性的伤口，或者止血剂要从伤口移除的应用中， 最好采用较低浓度的乙酸。 For example, strong adhesion to a wound, or if the application of chitosan fiber treatment does not require a deep wound or other hemostatic agents to remove from the wound, the lower concentration of acetic acid is preferably used. 在这样的实施方案中，通常使用浓度从约体积比或更低至约20%体积比，更优选使用浓度从约2、3、4、5、6、7、8、9或10%体积比至约11、12、1 3、14、 15、16、17、18或19%体积比。 In such an embodiment, typically used at a concentration from about 20% by volume or less to about a volume ratio, more preferably a concentration ratio of from about 9 or 10% by volume to about 11,12,1 3,14, 15, 16, or 19 volume percent. 当需要纤维之间强粘附性，或对伤口强粘附性时，优选浓度大于或等于约20%体积比，更优选从约50、55、60、65或70%体积比至约75、80、85、90、95或100%体积比，最优选从约95、96、97、98或99%体积比至100%体积比。 When a strong adhesion between the fibers need, or strongly adherent to the wound, the preferred concentration of greater than or equal to about 20% by volume, more preferably from about 50,55,60,65, or 70 percent by volume to about 75, 80,85,90,95 or 100% by volume, most preferably from about 95,96,97,98, or 99% by volume to 100% by volume. 可使用纺织工业中生产纤维通常使用的装置制备壳聚糖毛绒。  Preparation of chitosan fleece can be used in the textile industry production apparatus commonly used fibers. 如图6所示，生产壳聚糖毛绒的典型组装线可以使用加料器、松散机、梳理机、输送带和最后的卷切机。 6, the production of chitosan fleece can use the typical assembly line feeder, loose machines, carding machines, conveyors and the cutting machine final volume. 在加料器中，通过加料器加入壳聚糖短纤维，并进入松散机，其中用若干搅拌器松散壳聚糖短纤维。 In the feeder, the feeder was added by chitosan staple fibers, and loosely into the machine, wherein a stirrer with a plurality of loose chitosan staple fibers. 在梳理机中，通过圆筒和滚轮销的高速旋压，壳聚糖纤维被撕裂并转变为壳聚糖毛绒， 然后通过小滚筒（duffer)将毛绒作为网的分离薄层剥离。 In the carding machine, high-speed spinning cylinder and the roller pin, chitosan fiber is torn and converted to chitosan fleece, and then through a small cylinder (Duffer) the sheet pile as separate network release. 来自小滚筒的壳聚糖毛绒网薄层在输送带上移动。 A thin layer of chitosan fleece web from the small roller movement on the conveyor belt. 将调节的乙酸溶液喷雾在壳聚糖毛绒上，然后将特定量的微孔多糖微球平均分配，而壳聚糖毛绒网在输送带上移动。 Spraying a solution of acetic acid in the chitosan fleece was adjusted, and then a specific amount of evenly distributed microporous polysaccharide microspheres, and chitosan fleece web moving on the conveyor. 然后通过卷轴收集负载有微孔多糖微球的壳聚糖毛绒，再送入真空烘箱干燥。 Then collected loaded with microporous polysaccharide microspheres chitosan fleece by the reel, and then into the vacuum oven. 其中 K == 1. 81Xl(T3L/g，a = 0. 93。  wherein K == 1. 81Xl (T3L / g, a = 0. 93. 其中C1是HCl的浓度(mol L-1) ;C2是NaOH的浓度(mol L-1) 是HCl的体积(ml) ;V2是NaOH的体积（ml) ；G是样品重量；W是样品中水的百分比（％ )；以及0.016是相当于Iml 0. Imol L^1HCl (g)的NH2 的重量。  wherein C1 is the concentration of HCl (mol L-1); C2 is the concentration of NaOH (mol L-1) is a HCl volume (ml); V2 is NaOH volume (ml); G is the sample weight; W is It is the percentage of water in the sample (%); and 0.016 is equivalent to the weight of Iml 0. Imol L ^ 1HCl (g) of the NH2. 其中9. 94%是当CH3CONH基团100%脱乙酰时，理论NH2百分比。  wherein when 9.94% deacetylation, Percentage NH2 CH3CONH theory group 100%. 使用电感耦合等离子体原子发射光谱（ICP-AES)法测定Cr、Cu、Zn和Pb的含量。  the content of Cr, Cu, Zn and Pb (ICP-AES) Determination using inductively coupled plasma atomic emission spectroscopy. 测量前如下处理壳聚糖样品：准确称量0. Ig壳聚糖样品，然后浸入含有2mL 90%硝酸和0.6ml 50%HC104的坩埚中。 Chitosan samples was measured as follows before treatment: 0. Ig chitosan sample was accurately weighed, then immersed in a nitric acid and 2mL 90% of the crucible in 0.6ml 50% HC104. 壳聚糖样品逐渐溶解在混酸中，并同时经历氧化降解。 Chitosan samples were gradually dissolved in the mixed acid and simultaneously subjected to oxidative degradation. 反应2小时后，缓慢加热溶解的样品慢慢蒸发所有液体，然后使用喷灯燃烧至所有有机组分分解消失。 After two hours, the sample was slowly heated slowly to dissolve all liquid was evaporated, and to the use of a combustion burner of all organic components decompose to disappear. 用2%硝酸溶液稀释含有无机盐的残余物至10mL，然后使用ICP-AES (Jarrell-Ash 1100+2000 ICP-AES)测定重金属含量。 Inorganic salt containing a 2% dilute nitric acid solution to the residue was 10mL, heavy metal content was measured using ICP-AES (Jarrell-Ash 1100 + 2000 ICP-AES). 使用原子吸收光谱（AAS)测定壳聚糖中的汞含量。  Determination of mercury content using atomic absorption spectroscopy chitosan (AAS). 将准确称量的0. Ig壳聚糖样品溶于IOmL 2%硝酸。 Accurately weighed sample was dissolved in 0. Ig chitosan IOmL 2% nitric acid. 然后使用AAS测定样品中的汞含量。 AAS mercury content is then used in a measurement sample. 壳聚糖样品1的分析产生如下结果：水含量：11. 75% ；分子量：1326kDa ；脱乙酰度：91. 2% ；金属含量(μ g/g) :A1 59. UBa 2. 95、Ca 187、Cr 8. 86、Cu 3. 76、Fe 34. 9、Mg 59. UNa 169、Sil85、Pb 16. 3、Zn 25. 5、Hg 0. 16。 Analysis  The chitosan sample 1 produces the following results: water content: 11 75%; molecular weight:. 1326kDa; deacetylation degree: 91 2%; metal content (μ g / g): A1 59. UBa 2. 95, Ca 187, Cr 8. 86, Cu 3. 76, Fe 34. 9, Mg 59. UNa 169, Sil85, Pb 16. 3, Zn 25. 5, Hg 0. 16. 1407 KDa ；脱乙酰度：93· 6% ；金属含量（μ g/g) :A1106、Ba 4. 36, Ca 751、Cr 12. 6、Cu 40. 7、Fe 116、Mg 319、Na 193、Si 973、Pb 8. 76、Zn 8. 47 X IO3, Hg 0.16。  1407 KDa; deacetylation degree: 93 · 6%; metal content (μ g / g): A1106, Ba 4. 36, Ca 751, Cr 12. 6, Cu 40. 7, Fe 116, Mg 319, na 193, Si 973, Pb 8. 76, Zn 8. 47 X IO3, Hg 0.16. 基于壳聚糖样品1和2的分析结果，测试的壳聚糖纤维的质量是可以接受的，每一个样品均具有平均分子量> IOOOkDad百万），脱乙酰度> 90%，并且有害重金属（Cr、Cu、 Pb, Hg)含量非常低（除了壳聚糖样品2中的Zn含量）。  Based on the analysis results of Samples 1 and 2 are chitosan, chitosan fiber quality testing is acceptable, each of the samples had an average molecular weight> IOOOkDad million), degree of deacetylation of> 90%, and harmful heavy metals (Cr, Cu, Pb, Hg) content is very low (in the chitosan sample 2 except Zn content). 可以通过使用两步制造法实现微孔多糖微球增加的负载百分比。  The percentage load can be microporous polysaccharide microspheres using a two step increase in the production method. 第一步是松散壳聚糖纤维，第二步是梳理松散的壳聚糖纤维使之成为壳聚糖毛绒薄层。 The first step is to loose the chitosan fibers, the second step is carded fiber loose chitosan chitosan fleece to become thin. 壳聚糖毛绒的质量可以直接影响诸如微孔多糖微球的止血剂的负载百分比，其从而影响毛绒的止血功能。 Mass of chitosan fleece can directly affect the microporous polysaccharide microspheres, such as a load percentage hemostatic agent, thereby affecting its hemostatic function fleece. 当使用上述的两步法时，样品的微孔多糖微球负载百分比能够从小于或等于25%重量比增加至30-40%。 When the above-described two-step process, the load percentage of microporous polysaccharide microsphere sample can be from less than or equal to 25% by weight was increased to 30-40%. 通过构建采用乙酸溶液“粘结”在一起的壳聚糖纤维和微孔多糖微球层，从壳聚糖纤维制备止血蓬松物，然后真空干燥。  By using acetic acid construct "bonded" together chitosan fiber layer and microporous polysaccharide microspheres, hemostatic puff prepared from chitosan fibers, and then dried in vacuo. 制备PH值3. 0-4. 5的包括乙酸溶液的“粘结”溶液。 Preparation PH value include acetic acid solution, "binding" solution 3. 0-4. 5. 将壳聚糖纤维撕成片。 The chitosan fibers torn sheet. 在放置第一层壳聚糖片后，将所述乙酸溶液喷到所述壳聚糖片上，随后加入微孔多糖微球。 After placing a first sheet layer of chitosan, the acetic acid solution was sprayed onto the chitosan sheet, followed by addition of microporous polysaccharide microspheres. 通过相同的方法在第一层上形成第二层。 Forming a second layer on the first layer by the same method. 除了没有将微孔多糖微球加入至最上层外，以这种方式构建各层，直至得到7层。 Except that no microporous polysaccharide microspheres were added to the uppermost layer, the layers were constructed in this manner, until a 7 layer. 所述乙酸溶液不仅作为壳聚糖纤维层之间的胶合剂，也增加了止血粉粘附壳聚糖纤维的能力。 The acetic acid solution not only as a glue between the chitosan fiber layer, also increases the adhesion ability of chitosan fiber hemostatic powder. 可选择地，可以根据上述方法省略向壳聚糖层中加入微孔多糖微球的步骤而制备仅仅包含壳聚糖纤维的止血蓬松物。 Alternatively, may be omitted hemostatic puff prepared containing only chitosan fiber layer was added to the chitosan step microporous polysaccharide microspheres according to the methods described above. 表1提供了上述止血蓬松物中微孔多糖微球的负载效率。 Table 1 provides a hemostatic puff load efficiency of the microporous polysaccharide microspheres. *与其它实施例中所用的相比，将两倍的水喷到所述纤维上。  * used in the examples as compared with other embodiments, the water is sprayed twice onto the fibers. 由此制备的止血壳聚糖蓬松物显示出良好的止血功能和溶胀能力。  thus prepared chitosan hemostatic puff exhibit good swelling capacity and hemostatic function. 当置于伤口上或伤口内时，所述蓬松物迅速吸收血液。 When placed on the wound or wound when the puff rapidly absorbed into the blood. 血液通过前几层壳聚糖层，然后迅速固化防止了进一步的出血。 Blood through the front layers of the chitosan layer, and then rapidly solidified to prevent further bleeding. 如果所述蓬松物置于体内，则一段时间后，该止血壳聚糖蓬松物在体内生物降解为无毒的物质，因此不需要手术来去除该蓬松物。 If the puff into the body, the period of time, the hemostatic chitosan puff nontoxic degradation in vivo biological substance, and therefore do not need surgery to remove the fluff. 为了提高止血蓬松物的弹性，使用CELV0L™205PVA(由Celanese Ltd.，Dallas, Texas制造，用乙烯醇部分水解乙酸乙烯酯聚合物）修饰壳聚糖纤维以降低其亲水性。  In order to improve flexibility hemostatic puff using CELV0L ™ 205PVA (by the Celanese Ltd., Dallas, Texas manufacture, vinyl acetate polymers with partially hydrolyzed vinyl alcohol) modified chitosan fiber to reduce its hydrophilicity. 制备PVA修饰的止血蓬松物的步骤与制备未修饰的蓬松物的步骤相似，主要不同点是向用于壳聚糖层的乙酸溶液中加入PVA。 Step Preparation of modified PVA hemostatic puff unmodified fluff was similar, the main difference is added to the solution for the PVA layer of the chitosan acetic acid. PVA在乙酸溶液中的浓度为2%重量比。 PVA concentration in the acetic acid solution was 2% by weight. 与未修饰的蓬松物相比，PVA修饰的蓬松物具有稍微改善的弹性。 Compared to an unmodified fluff, PVA modified fluff having slightly improved elasticity. 根据下面的步骤制备止血海绵。  The following step of preparing hemostatic sponge. 将壳聚糖和PVA溶于稀释的乙酸溶液。 The chitosan and PVA dissolved in dilute acetic acid solution. 加入二氯化钯作为催化剂并加入二异氰酸甲苯酯作为发泡剂和交联剂。 Palladium dichloride was added as a catalyst and toluene diisocyanate was added as a foaming agent and a crosslinking agent ester. 用氨水洗涤粗产品并在烘箱中干燥。 The crude product is washed and dried in an oven with aqueous ammonia. 通过在所述海绵制备前向乙酸溶液中加入止血剂，或制备后向海绵中加载，向所述海绵任选地加载药物或治疗剂。 After loading into the sponge by the addition of a hemostatic agent to the acetic acid solution prior prepared sponge, or prepared, optionally loaded sponge to the drug or therapeutic agent. 根据下面的步骤制备止血织物。  The following step of preparing hemostatic fabric. 首先，制备PH3.0的重量比的乙酸水溶液。 First, the weight ratio of acetic acid aqueous solution prepared in PH3.0. 将壳聚糖纤维分离为片状，并均勻地铺在覆盖有隔离纸的玻璃板上形成薄层。 Separating the chitosan fibers into a sheet, and spread evenly in a thin layer is formed on a glass plate covered with a release paper. 将乙酸水溶液喷到所述壳聚糖纤维表面，并将特定量的止血粉分布到该壳聚糖纤维上。 The aqueous acetic acid solution sprayed onto the surface of the chitosan fibers, and a specific amount of powder distributed over the hemostatic chitosan fibers. 通过相同的方法制备其它层。 Other layers prepared by the same method. 将少量的乙酸水溶液喷到最顶层的壳聚糖纤维层上后，将聚四氟乙烯(TEFLON™)平板置于最顶层的壳聚糖纤维层上。 After a small amount of aqueous acetic acid solution sprayed onto the topmost layer of chitosan fibers, polytetrafluoroethylene (TEFLON ™) plate was placed on the topmost layer of chitosan fiber. 由此制备了包括五层的样品。 Thereby preparing a sample comprising five layers. 将整个体系置于真空烘箱中，并在50°C真空干燥3小时。  The entire system is placed in a vacuum oven, and dried in vacuo at 50 ° C 3 hours. 去除TEFLON™板和隔离纸，得到无纺止血织物。 TEFLON ™ sheet and removing the release paper, to obtain a nonwoven fabric hemostasis. 与所述TEFLON™板接触的上层用壳聚糖薄膜覆盖，而与所述隔离纸接触的底层由无纺纤维状壳聚糖构成，具有粗糙表面。 In contact with the upper plate is covered with a TEFLON ™ chitosan film and the bottom layer in contact with the release paper is constituted by a nonwoven fibrous chitosan, it has a rough surface. 使用扫描电子显微镜检查负载不同量的微孔多糖微球的壳聚糖毛绒。  Different amounts of a scanning electron microscope examination of chitosan fleece loaded microporous polysaccharide microspheres. 在15%负载时，观察到在壳聚糖毛绒上微孔多糖微球的非平均分布（图7)。 At 15% load, the observed non-microporous polysaccharide microspheres evenly distributed on the chitosan fleece (FIG. 7). 在60%负载时，几乎观察不到微孔多糖微球（图8)。 At 60% load, hardly observed microporous polysaccharide microspheres (FIG. 8). 相信在得到SEM图像以前或该过程中，微孔多糖微球从负载的壳聚糖毛绒上移去。 Believed to give an SEM image or the previous process, the microporous polysaccharide microspheres on the chitosan fleece was removed from the load. 在60%负载样品中，观察到样品容器表面上有颗粒微孔多糖微球。 60% load sample, observed particle microporous polysaccharide microspheres on the surface of the sample container. 也可能在制备样品的SEM溅涂过程中使用的真空将微孔多糖微球移去。 Vacuum may also be used in the sputtering process SEM sample preparation of microporous polysaccharide microspheres removed. 相信当松散微孔多糖微球沉积在壳聚糖毛绒间隙中，存在中性或弱酸性微孔多糖微球与阳离子壳聚糖的弱静电键。 Believed that when the loose microporous polysaccharide microspheres on the chitosan fleece is deposited in the gap, the presence of neutral or weakly acidic cation microporous polysaccharide microspheres and chitosan weak electrostatic bonds. 图IOAUOB和IOC提供物理负载在壳聚糖毛绒上的微孔多糖微球的SEM图像。 FIG IOAUOB and IOC provide SEM images of physical load on the chitosan fleece microporous polysaccharide microspheres. 所述负载毛绒被压成碳粘性带。 The pile is pressed into carbon load adhesive tape. 如图像所示，在转移有负载的毛绒至粘性带上的过程中，许多圆球被移去，但是保持其孔形态。 As shown in the image, the pile to bring the viscosity of the loaded transfer process, many ball is removed, it retains its pore morphology. 还观察到微孔多糖微球附着在壳聚糖毛绒丝条上。  It was also observed adhering the microporous polysaccharide microspheres on the chitosan fleece yarn. 在制造过程中可发生壳聚糖和微孔多糖微球的一定程度的熔解或熔化，形成扫描电子显微镜可见的键。 A degree of occurrence of microporous polysaccharide microspheres and chitosan in the manufacturing process of melting or melt, forming bonds scanning electron microscopic. 观察到微孔多糖微球成簇附着的丝条上，一个或更多微球融合在丝条上。 Observed that the microporous polysaccharide microspheres yarn clusters attached, the one or more microspheres are fused to the yarn. 这些融合的圆球通常具有平滑的表面，并且在不具有不直接附着在丝条上的簇中圆球的复杂的孔结构。 These fusion sphericity typically have a smooth surface, and has no complicated pore structure is not directly attached to the strands of the sphere cluster. 图9A和9B提供丧失孔结构的融合在壳聚糖纤维上或与其键合的微孔多糖微球簇的扫描电子显微照片。 9A and 9B provide loss of microporous polysaccharide microsphere clusters fused pore structure on chitosan fibers bonded thereto or a scanning electron micrograph. 一旦微孔多糖微球丧失其孔（这可能发生在熔化或熔解过程中），其作为促凝剂的效果会严重受损。 Once the microporous polysaccharide microspheres lose their holes (which may occur during melt or melt), which severely damaged the effect as a coagulant. 使用优选实施方案的方法通过在壳聚糖毛绒上负载微球，微孔多糖微球能与壳聚糖毛绒组合，而基本不改变各自组分的形态外表。  The method used by the preferred embodiment of a load on the chitosan fleece microspheres, microporous polysaccharide microspheres can be combined with chitosan fleece, without substantially altering the outer form of the respective components. 通过对旋转圆筒中、传送带上或类似装置上的壳聚糖纤维更均勻地使用弱酸，例如通过雾化器或喷雾器以更小微滴尺寸的使用弱酸，任选对壳聚糖纤维使用真空源将微滴送入纤维块中、并且/或者使用鼓风机将微滴送入纤维块中，可以实现微孔多糖微球在壳聚糖毛绒上更加平均的分布。 By rotating the cylinder, the chitosan fibers on a conveyor belt or similar device more uniformly weak acid, e.g., by nebulizer or atomizer smaller droplet size was measured using a weak acid, optionally with the use of a vacuum source chitosan fiber droplet into the fiber block and / or using a blower into droplets fiber block may be implemented microporous polysaccharide microspheres on the more even distribution of chitosan fleece. 在涂渍过程中水分水平的较严格控制也可以实现微球更好的分布、更高的负载水平或降低对毛绒和微球形态的影响。 In the process the level of moisture coated more stringent control may also be achieved a better distribution of microspheres, higher load levels or reduce the impact on the plush and microsphere morphology. 在制备负载了微孔多糖微球的壳聚糖毛绒的特别优选实施方案的过程中，为了避免水溶液中微球的溶解以及避免微球结构的瓦解，只将少量酸性溶液或冰醋酸喷雾在壳聚糖毛绒表面以维持适当的水分水平。  In the preparation of a particularly preferred embodiment the load of chitosan fleece microporous polysaccharide microspheres in an aqueous solution in order to avoid dissolution of the microspheres and to avoid microsphere collapse of structure, only a small amount of ice or acid solution spray acetate chitosan fleece surface to maintain proper moisture levels. 因此，微孔多糖微球主要被粘在壳聚糖毛绒上。 Accordingly, the microporous polysaccharide microspheres are mainly adhered to the chitosan fleece. 当不希望被任何特别理论束缚时，相信当在伤口上使用时，壳聚糖，任选地负载有微孔多糖微球，可具有两种重要作用机制。  While not wishing to be bound by any particular theory, the use is believed that when the wound, chitosan, optionally loaded with microporous polysaccharide microspheres, can have two important mechanisms of action. 一种是非常快速地阻止出血，因为微孔多糖微球能够快速吸收血液中的水分。 One is very quickly stop the bleeding, since the microporous polysaccharide microspheres can quickly absorb water in the blood. 另一种是修复伤口和任何遭受损坏的血管。 Another is to repair the wounds and blood vessels suffer any damage. 该第一作用能使伤口立即停止出血，而该第二作用能保护伤口并避免从遭受损坏或被切开的血管第二次出血。 The first action can immediately stop the bleeding wound, and the second action to protect the wound and to avoid being damaged or cut from the second vessel bleeding. 相信由湿润的壳聚糖毛绒支持的壳聚糖水溶胶的形成促成所述作用。 I believe the support form a wet chitosan fleece chitosan sol facilitate the action. 如上述讨论，通过梳理或类似方法处理壳聚糖可以产生毛绒层，其可被放置在传送带上用于进一步加工。  As discussed above, treatment of chitosan or the like by carding pile layer may be produced, which can be placed on a conveyer for further processing. 这种进一步的加工包括使壳聚糖毛绒负载诸如微孔多糖微球或其它多糖剂和/或止血剂。 Such further processing comprises a load such as chitosan fleece microporous polysaccharide microspheres or other polysaccharides and / or hemostatic agent. 在一个实施方案中，使毛绒负载微孔多糖微球的方法包含使用诸如冰醋酸的酸涂渍毛绒，任选地然后是使用多糖粉末或其它辅助剂的过程。 In one embodiment, a method stuffed load comprises microporous polysaccharide microspheres, such as glacial acetic acid using plush coated, and optionally a polysaccharide is a powder or other adjuvants process. 在酸涂渍过程中，雾化弱酸然后应用于壳聚糖毛绒。  In the acid coating process, atomized weak acid then applied to chitosan fleece. 可通过包括例如超声雾化的任何适合的方法完成该过程。 By any suitable method, for example, comprise an ultrasonic atomizer to complete the process. 所述的雾化的酸包含酸薄雾或酸雾，其经过位于传送带上的壳聚糖毛绒。 The atomized mist comprising an acid or acid mist, which is positioned on a conveyor belt through the chitosan fleece. 优选地，使用风机将雾化的酸薄雾同时吹到毛绒上，并使用抽出泵将薄雾通过毛绒和传送带吸入。 Preferably, the acid mist atomized fan simultaneously blown onto the pile, and the use of the mist extraction pump and the conveyor belt by suction pile. 照这样，经过并涂渍毛绒的酸薄雾的体积可以严密地控制，并且所述酸薄雾可以被包含在酸涂渍处理区域。 In this manner, after coated and acid mist plush volume may be closely controlled, and the acid mist can be contained in the acid coating process area. 在毛绒被酸涂渍后，其可进入粉末应用处理区域，如果需要，粉末化的微孔多糖微球或其它粉末化试剂被负载在毛绒上。  After being coated plush acid, it can enter a powder application processing area, if necessary, powdered microporous polysaccharide microspheres or other powdered reagent is supported on the pile. 优选地，将粉末化的微孔多糖微球放置在振动滤网中，使用风机和抽出泵同时将其吹至所述毛绒并穿过毛绒和传送带将其吸入。 Preferably, the powdered microporous polysaccharide microspheres placed in a vibrating sieve, while the use of fans and pumps withdrawn to be blown through the pile and pile and to be sucked into the conveyor. 照这样，用于毛绒的多糖粉末的体积可以严格地控制，并且所述多糖粉末可以被基本包含在粉末应用处理区域内。 In this manner, the volume of the polysaccharide powder for the pile can be strictly controlled, and the polysaccharide powder may be substantially contained within a powder application processing area. 优选地，酸涂渍处理区域和粉末应用处理区域基本相互隔离。  Preferably, the acid coating process area and a powder application processing area is substantially isolated from each other. 在应用多糖后，优选将毛绒送至干燥装置。 After the application of the polysaccharide, preferably the pile to a drying apparatus. 上述方法提供负载了微孔多糖微球的毛绒层。  The method provides a load-pile layer of microporous polysaccharide microspheres. 可以理解，进一步的处理可以用于将这种层掺入无纺织物中，其中若干经负载的毛绒层相互附着以制成负载多糖的壳聚糖毛绒无纺织物。 It will be appreciated, further processing may be used for the incorporation of such a nonwoven fabric layer, wherein the pile layer is supported by a number attached to each other to make a nonwoven fabric of chitosan fleece loaded polysaccharide. 根据一个实施方案，无纺织物制造方法使用缠绕衬纸的滚筒。  According to one embodiment, the method for producing the nonwoven fabric backing paper winding drum. 优选使用诸如冰醋酸或弱酸溶液涂渍衬纸，以便使负载壳聚糖毛绒的底层与其粘附。 Preferably using a weak acid solution such as glacial acetic acid or a coated backing paper, so that the bottom of chitosan fleece loaded adhered thereto. 使用另一酸涂渍喷雾底部毛绒层，将负载毛绒的另一层放置在酸涂渍毛绒上。 Another use of the acid coating spray bottom pile layer, the pile of load placed on another acid coating plush. 由于在底层上的酸涂渍，所述毛绒层与另一层融合。 Since the acid coating on the bottom of the pile and another integration layer. 该酸涂渍和毛绒包裹方法，如果需要能够继续形成许多毛绒层以生产无纺织物。 The acid coating and stuffed coating process, if necessary to continue to form a plurality of pile layer to produce a nonwoven fabric. 一旦形成合适数量的层，就将毛绒从圆筒中移去，并输送至压力机，其对毛绒施加压力以进一步成键并压实无纺织物。 Once a suitable number of layers is formed, the cylinder will be removed from the pile, and transported to a press which applies pressure to the pile for further compaction and bonding a nonwoven fabric. 在一个实施方案中，所述毛绒在压力机中干燥。 In one embodiment, the pile dried in a press. 当不希望被任何特别的理论束缚时，相信当与淀粉混合时，由于新的壳聚糖夹入淀粉的聚合物的形成，壳聚糖的止血效率比单独的壳聚糖或淀粉要好得多。  While not wishing to be bound by any particular theory, the believed that when mixed with the starch, since the newly formed starch interposed chitosan polymers, chitosan hemostatic efficiency of the starch or chitosan alone much better. 壳聚糖和淀粉具有类似的结构和好的相容性。 Chitosan and starch, have a similar structure and good compatibility. 当酸溶液存在时，聚合物在熔融态或成形态（plasticized state)互相混合时，被认为发生了壳聚糖和淀粉的互相渗透和大分子链的纠缠。 When the presence of an acid solution, or the polymer in the molten state to form (plasticized state) are mixed with each other, that is chitosan and starch entanglement and interpenetration of the macromolecular chains occur. 然而，两种聚合物链的互相渗透和纠缠通常归因于物理现象，该现象可以改变原始聚合物的某些物理性质，而不改变其化学结构。 However, both the polymer chain entanglement and interpenetration generally attributed to a physical phenomenon that can change certain physical properties of the original polymer, without changing their chemical structure. 因此，互相渗透和纠缠的聚合物被认为是聚合物混合物或聚合物组合物，但是不是新的聚合物。 Thus, interpenetrating entangled polymer and is considered to be a mixture of a polymer or polymer composition, but not the new polymer. 在壳聚糖中，有大量能与酰基（-C(O)-)、酯基（-C00R) 或醚基（-0-)中的氧原子形成氢键的氨基（-NH2)。 Chitosan, there can be a large number of acyl (-C (O) -) amino-hydrogen bond (-NH2) form an oxygen atom, an ester group (-C00R) or an ether group (-0-). 相信在壳聚糖和淀粉聚合物链之间存在氢键。 Believed that hydrogen bonds between the chitosan and starch polymer chains. 然而，氢键通常被划分为不改变化学结构的物理相互作用。 However, hydrogen is generally divided into physical interaction does not change the chemical structure. 在某些条件下（诸如加热、催化剂的存在等等），氨基可与活性醛或酮基反应以产生SchifT键，其被认为是化学反应。 Under certain conditions (such as heat, catalyst, etc. ), an amino group can react with the active aldehyde or ketone groups to produce SchifT key, which is considered a chemical reaction. 通常在多糖中没有足够的活性醛或酮基以促进该键的形成，所以Schiff键的产生通常在壳聚糖和多糖的组合中观察不到。 Usually not sufficiently active aldehyde or ketone group in the polysaccharide to facilitate the formation of the bond, the bond is generated Schiff not normally observed in the combination of chitosan and polysaccharide. Everaers 等人，Science，Vol. 303，2004 年2 月6 日，第823-826 页报道了纠缠的聚合物液体的流变学和微观拓扑学。  Everaers et al., Science, Vol. 303,2004 On February 6, pp. 823-826 reported the rheological and microscopic topology entangled polymer liquids. 人们发现高分子量聚合物液体的粘弹性性质由分子尺度上的拓扑学约束所支配。 It was found that high molecular weight polymer viscoelastic properties of liquid governed by the topological constraints on a molecular scale. 以与纠缠的绳子的类似方式，聚合物链可以滑动，但是不能互相通过。 In a similar manner to the rope entangled polymer chain can slide, but can not pass each other. 聚合物动力学的管道模型和流变学是基于这样的想法，即纠缠将链限制在围绕原始路径的小波动，该路径跟随纹理粗糙的链轮廓。 Polymer dynamics and rheology pipe model is based on the idea that a chain entanglement around the small fluctuation limit in the original path, the path follows the contour chain rough texture. Everaers等人提供了这些现象模型的微观基础，他们以原始路径方式分析了聚合物液体拓扑学态，以得到对平台模量（plateau modulus)的无参数的、定量的预测，该预测与所有主要类型的合成聚合物的实验数据一致。 Providing micro Everaers et al models based on these phenomena, their original path way analysis of topology state polymer liquid to obtain a platform modulus (plateau modulus) without parameters, quantitative prediction, the predicted all major consistent with the experimental data of the type of synthetic polymer. 如Viyoch 等人在International Journal of Cosmetic Science，25(3)， 113(2003)中讨论的，分子量100，000道尔顿的壳聚糖和诸如玉米、马铃薯或木薯淀粉的淀粉能够用于制备含有罗望子果实提取物的化妆品贴片（patch)。  The Viyoch et al., International Journal of Cosmetic Science, 25 (3), 113 (2003) discussion, the molecular weight of chitosan and 100,000 daltons such as corn starch, potato or tapioca starch can be used in the preparation of cosmetic patch (patch) containing tamarind fruit extract. 研究了不含罗望子的贴片的物理化学性质，例如弹性、颜色、透明度、完整性、光泽、吸水性、生物粘附性和稳定性。 The physical chemical properties of tamarind patch, such as elasticity, color, transparency, integrity, gloss, water-absorbent bioadhesive and stability. 在4°C、室温和45°C下将制备的贴片保持两周以进行稳定性的测试。 At 4 ° C, room temperature and 45 ° C for two weeks is the patch prepared for testing stability. 结果表明由壳聚糖：玉米淀粉为4. 5 ： 0.5(0；.5:(1.5)、壳聚糖：木薯淀粉为4.5 ： 0.5(CT4.5 ； 0.5)和4.0 ： 1.0(CT4.5: L0)组成的制剂提供具有良好物理性质、高吸水性、良好生物粘附性和良好稳定性的贴片。将冻干的罗望子提取物以相应于5%酒石酸的量引入CC4.5 ： 0.5ΧΤ4.5 ： 0.5 和CT4.5: u的制剂中后，贴片粘附皮肤的能力有所改善。然而，在室温或45°C下保持贴片6周，其颜色加深，而其弹性和皮肤粘附性性质降低。通过观察渗透Silastic⑪膜(Dow-Corning,Midland,MI)的酒石酸的累积量进行体外12小时渗透测试。CC4.5 ： α5贴片具有最高酒石酸释放量。所有混合聚合物基质的释放模式展现了两个不同的阶段：快速阶段， 其中流量平均为3. 61 μ gmirT1 mm 2 ；慢速阶段，其中流量平均为1. 89 μ gmirT1 mm 2。Viyoch 等人描述制备壳聚糖和淀粉混合物的方法可以适用于制备优选实施方案 The results show that chitosan: corn starch is 4.5: 0.5 (0; .5: (1.5), chitosan: tapioca starch is 4.5: 0.5 (CT4.5; 0.5) and 4.0: 1.0 (CT4.5 :. L0) a composition provides a formulation, high water absorption, good and excellent bioadhesive patch having good physical stability properties lyophilized tamarind extract in an amount corresponding to 5% tartaric acid introduced CC4.5: 0.5ΧΤ4.5: 0.5 and CT4.5: u after the preparation, the patch has improved skin adhesion ability, however, to maintain the patch 6 weeks at room temperature or 45 ° C, the color deepened, while its elasticity. skin adhesion properties and reduced 12 hours in vitro permeation test through observation .CC4.5 Silastic⑪ permeable membrane (Dow-Corning, Midland, MI) the cumulative amount of tartaric acid:. α5 tartaric patch with the highest release all the polymerization mixture. matrix release profile was demonstrated two distinct phases: rapid phase, wherein the average flow rate of 3. 61 μ gmirT1 mm 2; slow stage, wherein the average flow rate of 1. 89 μ gmirT1 mm 2.Viyoch et al. describe the preparation of shell polysaccharides and starch mixture may be a method suitable for preparing a preferred embodiment 的材料的壳聚糖基质或止血剂的制备。 Preparation of Chitosan hemostatic agent or matrix material. 通过提供用具有微孔表面的右旋糖酐涂渍的壳聚糖纤维可实现高级涂渍，而不是通过沉积微孔多糖微球。  may be implemented by providing advanced coated with dextran having a microporous surface of the coated chitosan fiber, rather than by deposition of microporous polysaccharide microspheres. 能够使用任意一种方法制备右旋糖酐涂层。 Dextran coating can be prepared using any method. 例如，右旋糖酐可溶于水中或弱酸溶液以通过温和氧化赋予该分子电负性，借此产生羧基。 For example, dextran may be dissolved in water or weak acid solution to impart a negative electrical by mild oxidation of the molecule, thereby producing a carboxyl group. 在控制条件下，右旋糖酐也可经反应以纠缠聚合物。 Under controlled conditions, it may also be reacted to dextran polymer entanglement. 壳聚糖右旋糖酐混合物可被冻干以产生在壳聚糖纤维上具有微孔的表面。 Chitosan dextran mixture may be lyophilized to produce a surface having micropores on chitosan fibers. 通过直链或支链淀粉的各种组成，可以控制右旋糖酐涂层的程度，可控制涂层的厚度以及可控制孔尺寸。 Extent by various straight or branched chain starch composition can be controlled dextran coating thickness of the coating can be controlled and pore size can be controlled. 带负电的右旋糖酐和阳离子壳聚糖反应可以形成化学键。 Cationic chitosan and dextran negatively charged reaction may form a chemical bond. 可通过光学和电子显微镜以及材料切片的组织化学监视所有这些过程以确定是否成功成键。 All of these processes can be monitored by light and electron microscopy and chemical materials tissue sections to determine whether a successful bond. 该技术的变化涉及制备右旋糖酐涂覆的微孔壳聚糖和非涂覆的壳聚糖的交互层， 以制备无纺毛绒和织物的梯度。  variation of this technique involves the preparation of dextran-coated and non-coated microporous chitosan chitosan interaction layer to produce a gradient of the nonwoven fabric and the pile. 本领域已知的将右旋糖酐涂层应用于各种基质的方法能够加以变化以产生将右旋糖酐涂覆应用于壳聚糖纤维的方法。 The method of dextran coating to various substrates known in the art can be varied to produce the dextran coating method applied chitosan fiber. 微孔多糖微球对右旋糖酐涂覆的壳聚糖纤维也具有优秀的粘附性。 Microporous polysaccharide microspheres on the chitosan dextran coated fibers also have excellent adhesion. 因此，在某些实施方案中，希望在微孔多糖微球沉积前用右旋糖酐预处理壳聚糖纤维。 Thus, in some embodiments, it is desirable dextran pretreated with chitosan fibers prior to depositing microporous polysaccharide microspheres. 术语“壳聚糖”对应于一组不同脱乙酰度（DA)的聚合物族。  The term "chitosan" corresponds to a set of different degree of deacetylation (DA) of the polymer family. 壳聚糖通常在约50 至70% DA变化，并具有不同粘度、溶解性和止血性质。 Chitosan is typically about 50 to 70% DA change, and having a different viscosity, solubility and hemostatic properties. 因为壳聚糖聚合物的特性，即其反应性、溶解性和结合MPH的能力，依赖于甲壳质和壳聚糖的DA，所以希望进行分析以确定DA。 Because the characteristics of chitosan polymers, i.e., reactivity, solubility, and binding capacity MPH, dependent on chitin and chitosan DA, it is desirable to be analyzed to determine DA. FTIR光谱和C13质量NMR光谱与壳聚糖分析有关。 FTIR spectroscopy and C13 NMR spectroscopy and mass analysis of chitosan. 用于确定甲壳质和壳聚糖的乙酰化度的技术优选FTIR光谱。 FTIR spectroscopy technique for determining the preferred degree of acetylation of chitin and chitosan. FTIR光谱具有无损、快速、极其灵敏、使用者友好、低价和适用于可溶和不溶样品的优点。 FTIR spectroscopy has a non-destructive, rapid, highly sensitive and user-friendly, low-cost and suitable for soluble and insoluble samples advantage. 分析前，如同为临床应用而生产，从甲壳质中除去所有蛋白质和内毒素。  Prior to analysis, as produced for clinical use, removal of all proteins and endotoxins from chitin. 测定壳聚糖纤维以确定其横截面、抗拉强度、断裂强度、负载强度及其外观。 Determination of chitosan fiber to determine its cross-section, tensile strength, breaking strength, load strength and appearance. 在制造壳聚糖毛绒和壳聚糖海绵以及制造壳聚糖织物时使用该工业工程方法。 In the manufacture of chitosan and chitosan sponge stuffed and methods of using the industrial engineering manufacturing chitosan fabric. 在模型系统中测定微孔多糖微球的饱和量以确定用于三种主要类型出血的适当的物理性质。 Determination of the amount of saturated microporous polysaccharide microspheres in model systems to determine the appropriate physical properties for the three main types of bleeding. 使用建立的和在线的方法测量晶体结构、尺寸、甲壳质DA、平均分子量、重金属含量以及壳聚糖纤维的毒性。  and on-line using the established methods for measuring the crystal structure, size, chitin DA, average molecular weight, the content of heavy metals and toxic chitosan fiber. 表征测试包括测定纤维长度、牵拉率、平均纤维溶涨即吸收蒸馏水前后纤维直径的比率、以及PH。 Characterization tests comprises measuring the fiber length, the pulling rate, i.e., average fiber swelling ratio of absorbent fiber diameter front distilled water, and PH. 对比具有50至80%重量比或更高的DA的壳聚糖。 Comparative chitosan having 50 to 80% by weight or more of the DA. 分析的材料包括微孔多糖微球、不同DA的壳聚糖以及壳聚糖-微孔多糖微球材料。 Analysis material comprises microporous polysaccharide microspheres, chitosan and chitosan different DA - microporous polysaccharide microsphere materials. 还进行了水和血液吸收、水和血液释放比率、局部贮留（使用凝胶强度）以及用于止血的筛选试验。 Also blood and water absorption, the rate of release of water and blood, partial reserving (gel strength) as well as screening assays for hemostasis. 因为红细胞聚合作用（凝集反应）被认为是壳聚糖诱导血液凝结的主要因素，简单的血细胞凝集试验可以用于产品的快速筛选。 Because polymerization erythrocytes (agglutination) is considered a major factor in blood coagulation induced chitosan, simple hemagglutination assay can be used for rapid screening of the product. 本领域已知简单的血细胞凝集试验。  it is known in the art simple hemagglutination assays. 在储液中配制壳聚糖、壳聚糖_微孔多糖微球以及微孔多糖微球组合物，含有2000 μ g/ml材料。 Chitosan liquid formulation in the reservoir, the chitosan _ microporous polysaccharide microspheres, and microporous polysaccharide microsphere compositions, containing 2000 μ g / ml material. 使用10倍稀释得到0. 9% NaCl (生理盐水)中的最终浓度为1000、100、10或0. 1 μ g/ml，0· 2ml容积。 Diluted 10-fold to give a final concentration of 0. 9% NaCl (physiological saline) for 1000, 100, or 0. 1 μ g / ml, 0 · 2ml volume. 使用Alsever' s溶液冲洗人红细胞（从血库中得到）两次，并用0.9%氯化钠冲洗两次。 Use Alsever 's solution was rinsed human erythrocytes (obtained from blood banks) twice, and washed twice with 0.9% sodium chloride. 氯化钠用于防止脱乙酰甲壳质和其它离子之间的不相容性。 Sodium chloride is used to prevent the incompatibility between chitosan and other ions. 在生理盐水（0.9% NaCl)中混悬洗涤过的红细胞， 并使用比色计（Klett-SummerSon，No.64过滤器）调节至70%透光率。 Washed suspended in physiological saline (0.9% NaCl) in red blood cells, and adjusted to 70% using light transmittance colorimeter (Klett-SummerSon, No.64 Filter). 向壳聚糖-微孔多糖微球、壳聚糖和微孔多糖微球组合物的各种稀释液中加入等体积的红细胞悬液（0. 2ml)。 The chitosan - microporous polysaccharide microspheres, various dilutions of microporous polysaccharide microspheres and chitosan composition is added an equal volume of RBC suspension (0. 2ml). 读数前试管在室温下孵育两小时。 Before reading the tubes were incubated at room temperature for two hours. 脱乙酰甲壳质（壳聚糖）正常地在1 μ g/ml的浓度下产生人血红细胞的血细胞凝集。 Deacetylated chitin (chitosan) normally generated hemagglutination of human erythrocytes at a concentration of 1 μ g / ml of. 使用利用反射干涉光谱（RIFS)的生物医学传感器确定蛋白质结合能力，该光谱能够确定蛋白质吸收于单独的壳聚糖、壳聚糖_微孔多糖微球和微孔多糖微球表面上的动力学。  using the reflection using interference spectroscopy (RIFS) biomedical sensor to determine the protein binding capacity, the absorption spectrum can be determined in a separate proteins chitosan, the microporous polysaccharide microspheres and chitosan microporous polysaccharide microsphere surface _ the kinetics. 一旦得到用于止血的最佳壳聚糖-微孔多糖微球，可迅速评估各批次蛋白质的结合能力，该参数与上述大鼠模型中的止血效果相关。 Once hemostasis best Chitosan - microporous polysaccharide microspheres, can quickly assess the binding capacity of each batch of protein, the parameter related to the hemostatic effects of the rat model. 可使用不同于乙酸处理的体系来溶解和加载微孔多糖微球至壳聚糖，实现壳聚糖负载微孔多糖微球的最优化。  The processing system may be different from the acid used to dissolve and microporous polysaccharide microspheres loaded with chitosan, chitosan achieve load microporous polysaccharide microspheres optimized. 乳酸比乙酸可以降低更多的毒性。 Lactic acid can be reduced more toxic than acetic acid. 能想象的是，通过选择性的淀粉氧化和阴离子态的产生可加强作为非极性多糖的微孔多糖微球（淀粉）与作为强阳离子多糖的壳聚糖的结合。 Imagine that the oxidation of starch produced by anionic state and enhance selectivity as a non-polar microporous polysaccharide microspheres of polysaccharides (starch) in combination with a strong cationic polysaccharide chitosan. 进行了带有和不带有微孔多糖微球的壳聚糖纤维、壳聚糖毛绒和织物的降解动力学的研究。  degradation kinetics was studied of chitosan fiber with and without microporous polysaccharide microspheres and chitosan fleece fabric. 使用多光子成像和光谱评价了壳聚糖、壳聚糖_微孔多糖微球和微孔多糖微球与人和猪全血和血小板的相互作用，以进行壳聚糖_微孔多糖微球毛绒和织物的止血机制的研究。 Using multiphoton imaging and spectroscopic evaluation of chitosan, chitosan _ microporous polysaccharide microspheres and microporous polysaccharide microspheres interact with human and porcine whole blood and platelets, for Chitosan _ microporous polysaccharide microsphere hemostatic mechanism and plush fabrics. 将这些结果与应用NAG提供的测定进行了比较。 These measurement results provided by NAG applications were compared. 研究了体外凝血快的形成、RBC聚集以及血小板激活。 Fast formation in vitro studies coagulation, RBC aggregation and platelet activation. 已经进行了大规模生产混有微孔多糖微球的壳聚糖毛绒和无纺织物的生产线的设计和制造。  design and manufacturing has been mixed with the mass production of microporous polysaccharide microspheres and chitosan fleece of non-woven fabric production line. 开发了用以完成以下功能的机器：松散壳聚糖纤维；梳理松散的纤维成为薄毛绒网；使用稀乙酸（或乳酸）溶液润湿纤维毛绒；在该湿润的壳聚糖纤维薄片上均勻地负载微孔多糖微球；将负载微孔多糖微球的壳聚糖纤维薄片卷在卷轴上；以及真空干燥纤维。 We developed the machine to perform the following functions: loose chitosan fiber; loose fibers become thin carded pile network; using dilute acetic acid (or lactic acid) was wetted fiber pile; on chitosan fibers of the wet sheet uniformly supported microporous polysaccharide microspheres; load microporous polysaccharide microspheres chitosan fiber sheet wound on the spool; and dried in vacuo fibers. 设计并组装了全自动或半自动生产线以生产标准化的大批量的壳聚糖_微孔多糖微球毛绒和无纺织物。 Designed and assembled in a fully or partially automated production line mass production of standardized _ chitosan and microporous polysaccharide microsphere fleece nonwoven fabric. 进行了不同毛绒制备的密度试验以优化空隙尺寸和止血的最佳毛绒密度。 Density of different preparations were stuffed to optimize the optimum void size and density of the pile hemostasis. 在胶原毛绒上进行了类似的试验。 Similar tests carried out on a pile of collagen. 使用军队为测试和对比评价壳聚糖_微孔多糖微球材料定义的模型最优化制剂。  _ is defined using a model Army microporous polysaccharide microsphere materials and the comparative evaluation test of chitosan optimized formulation. 这些模型包括肝损伤模型（猪）中的致命的主动脉穿孔损伤和大静脉和弥散毛细血管出血。 These models include liver injury model (pig) in damage and fatal perforation of the aorta and vena cava diffuse capillary bleeding. 从文献中得到的动脉导管插入损伤的遥控封闭模型能迅速适于使用壳聚糖-微孔多糖微球封闭损伤。 Remote closed models obtained from the literature arterial catheterization injury can quickly adapted chitosan - microporous polysaccharide microspheres closed injury. 兔口腔出血模型使得能在凝结状态易于改变（血小板、肝素化）的动物的血管器官系统中进行试验。 Oral bleeding rabbit model enables the coagulation test is easy to change state (platelets, heparin) of the vascular system of animal organs. 该模型已用液体壳聚糖作为止血剂进行过试验。 The model has been tested as a hemostatic agent for a liquid chitosan. 用于动脉穿刺和导管插入术后的活跃出血控制的模型是肝素化动物中犬股动脉穿孔。  for arterial puncture and active hemorrhage after catheter insertion control model is an animal heparinized canine femoral artery perforation. 对股动脉中放置了11. 5 French导管4-6小时的三只动物进行肝素化，使活化凝血时间（ACT)为正常的2-3倍，并通过IV液体替换保持在正常张力水平。 Placed in the femoral artery 11. 5 French catheter of 4-6 hours three animals were heparinized, the activated clotting time (ACT) of 2-3 times normal, and remains in the normal tension level replacement by IV fluid. 移除留置的动脉导管，立刻将壳聚糖-微孔多糖微球贴片（2X2cm)以最小的压力应用到出血血管10分钟。 Removing indwelling arterial catheter immediately chitosan - microporous polysaccharide microsphere patch (2x2cm) with minimal pressure applied to the bleeding vessel for 10 minutes. 录像带记录这些研究。 These studies videotape recording. 试验在狗3上进行，狗重25. 7kg;性别：雌性；凝结时间ACT277秒。  Tests were conducted on Dog 3 Dog weight 25. 7kg; Gender: Female; ACT277 second setting time. 犬股动脉中的所述导管为11. 5F的导管。 The canine femoral artery catheter of the catheter 11. 5F. 在去除11. 5F的导管后，立即将l-2cm3的壳聚糖-微孔多糖微球置于股动脉穿刺孔上。 After removal of the catheter 11. 5F, immediately l-2cm3 chitosan - microporous polysaccharide microspheres placed on the femoral artery puncture hole. 对所述毛绒进行手动加压10分钟，出血完全停止，实现绝对止血。 Manually pressing the pile 10 minutes, the bleeding stopped completely, to achieve an absolute hemostasis. 将壳聚糖-微孔多糖微球应用于股静脉穿刺孔，去除另一11. 5F导管，并保持手动加压7分钟。 Chitosan - microporous polysaccharide microspheres applied femoral vein puncture hole, removing a further conduit 11. 5F, and 7 minutes to maintain the pressure manually. 实现了完全止血。 Achieve complete hemostasis. 通过在近端进行结扎使静脉血压上升，所述壳聚糖-微孔多糖微球依然粘附而无出血。 By ligation of the proximal venous blood pressure, the chitosan - still adhered microporous polysaccharide microspheres without bleeding. 试验在狗4上进行，狗重25. 4kg ；性别：雌性；凝结时间ACT280秒。  Tests were conducted on 4 dogs, dog weight 25. 4kg; Gender: Female; ACT280 second setting time. 去除11. 5F的导管后，立即将l-2cm3的壳聚糖-微孔多糖微球置于所述股动脉穿刺孔上，并手动按压10 分钟。 After removal of the catheter 11. 5F, immediately l-2cm3 chitosan - microporous polysaccharide microspheres placed on the femoral artery puncture hole, and manual pressure for 10 minutes. 观察到完全止血及所述毛绒明显粘附。 Complete hemostasis was observed and the pile significantly adhesion. 试验在狗5上进行，狗重23. Ikg ；性别：雄性；凝结时间ACT340秒。  Tests were conducted on Dog 5 Dog weight 23. Ikg; Gender: Male; ACT340 second setting time. 去除11. 5F的导管后，立即将PVA处理的壳聚糖-微孔多糖微球毛绒（Icm3)置于所述股动脉穿刺孔上，并手动按压10分钟。 After removal of the catheter 11. 5F, immediately PVA treated chitosan - microporous polysaccharide microsphere fleece (Icm3) was placed on the femoral artery puncture hole, and manual pressure for 10 minutes. 出血停止，但30秒后观察到所述穿刺伤口的中度出血。 Bleeding stopped, but after 30 seconds the observed moderate bleeding puncture wound. 用相同PVA处理的壳聚糖-微孔多糖微球毛绒（10分钟手动按压）进行的二次尝试失败。 Chitosan treated with the same PVA - microporous polysaccharide microsphere fleece (10 minutes manual compression) of the second attempt failed. 随后用不含PVA 的壳聚糖_微孔多糖微球无纺织物替代该相对无粘附性的PVA处理的壳聚糖-微孔多糖微球毛绒。 Followed by the chitosan-free PVA _ microporous polysaccharide microspheres Alternatively chitosan non-woven fabric relatively non-adhesive to the PVA processing - microporous polysaccharide microsphere fleece. 手动按压15分钟后实现完全的止血。 Manual compression to achieve complete hemostasis after 15 minutes. 对伤口观察20分钟，未观察到出血。 The wound was observed for 20 minutes, no bleeding was observed. 所述无PVA处理的壳聚糖-微孔多糖微球织物与所述动脉和周围的组织紧密粘合。 The non-PVA treated chitosan - microporous polysaccharide microsphere fabric and tissue surrounding the artery and close adhesion. 切除带织物的动脉进行病理学研究。 With arteries were excised fabric pathology. 狗试验证明壳聚糖_微孔多糖微球毛绒（无PVA处理的)在肝素化的犬动脉导管插入模型中是极为有效的止血剂。  Chitosan _ dog test proved microporous polysaccharide microsphere fleece (non-PVA treated) is extremely effective hemostatic agent in heparinized canine model of arterial catheterization. 将大孔导管（11. 5F)留存4-6小时导致明显塑形的血管道（vascular breech)，且考虑到明显延长的凝结时间这对止血的确是一个挑战。 Macroporous catheters (11. 5F) for 4-6 hours results in a significant retention vessel shaped channel (vascular breech), and taking into account the prolonged coagulation time which hemostasis is indeed a challenge. 壳聚糖-MPH毛绒也顺应所述动脉的轮廓，并不会干涉远端血流，并形成明显的粘附。 Chitosan -MPH pile profile also conform to the artery, the distal end and does not interfere with blood flow, and form a clear adhesive. 壳聚糖-微孔多糖微球毛绒在导管插入的股静脉中可同样有效地实现止血，并同样产生明显地粘附而不影响血流。 Chitosan - microporous polysaccharide microsphere fleece in the femoral vein catheterization may be equally effective in achieving hemostasis, adhesion and also produced significantly without affecting blood flow. 壳聚糖-微孔多糖微球毛绒（PVA处理的）在一次实验中仅获得中等至极小的止血效果，并且相对不粘附。 Chitosan - microporous polysaccharide microsphere fleece (PVA treated) obtained in one experiment only moderate hemostatic effect extremely small, and relatively non-sticking. 用无PVA处理的壳聚糖-MPH织物贴片可以确保完全止血。 -MPH fabric patch with no PVA treated chitosan ensure complete hemostasis. 巴比妥麻醉后，将三只大鼠的股动脉和静脉（0D 1. 5-2mm)双侧暴露。  After pentobarbital anesthesia, the femoral artery and vein of three rats (0D 1. 5-2mm) bilateral exposure. 在每一动脉上用30规格的针形成穿刺伤口，将壳聚糖-微孔多糖微球织物的纱布（3mm3)置于穿刺位点10秒钟，并监测出血。 Forming the puncture wound with 30 gauge needle in each artery, chitosan - gauze microporous polysaccharide microsphere fabric (3mm3) placed in the puncture site for 10 seconds, and to monitor bleeding. 未使用PVA处理的材料。 PVA treated material is not used. 控制从受伤的薄壁大鼠股血管的出血100分钟是止血上的挑战。  from the control rat femoral thin-walled blood vessels hemorrhage injured 100 minutes is the challenge to stop bleeding. 通过暴露两侧股动脉，用30规格的针来穿刺动脉，形成动脉破口和活跃出血。 By exposing both sides of the femoral artery, with a 30 gauge needle puncture to the artery, formation of arterial laceration and brisk bleeding. 试验在大鼠1号上进行，雄性，520g。  Tests were conducted on Rat No. 1, male, 520g. 用壳聚糖-微孔多糖微球织物的纱布处理右侧的股动脉穿刺伤口。 Right femoral artery puncture wound was treated gauze microporous polysaccharide microsphere fabric - chitosan. 对该纱布轻轻按压30秒，释放后该织物下有非常微量的出血。 Gently press the gauze 30 seconds, a very slight amount of bleeding under the fabric upon release. 再次进行轻微的手动按压10秒，出血完全停止。 Again a slight manual pressure for 10 seconds, the bleeding stopped completely. 观察到完全止血后20分钟，在所述股动脉的近端和远端进行结扎，进行爆裂强度测试。 It was observed for 20 minutes ligated proximal and distal ends of the femoral artery after complete hemostasis, burst strength test. 所述织物修复的伤口在120mmHg下仍保持完好。 The wound repair fabric remains intact under at 120mmHg. 试验在大鼠2号上进行，雄性，525g。  2 test was carried out on rats, male, 525g. 用3mm2的壳聚糖-微孔多糖微球织物的纱布处理左侧的股动脉穿刺伤口。 The left femoral artery puncture wound was treated gauze microporous polysaccharide microsphere fabric - 3mm2 with the chitosan. 对该纱布手动按压10秒，手动按压释放后该织物贴片下有非常微量的出血。 10 seconds manually pressing the gauze, has a very slight amount of bleeding under the fabric patch after manual pressure release. 再次进行手动按压2秒，但仍有逐渐降低速率的微量出血。 Manually pressing 2 seconds again, but there are still traces gradually reduce the rate of bleeding. 未进行继续按压，56秒后出血完全停止。 The pressing is not performed continues, the bleeding stopped after 56 seconds. 观察到完全止血后20分钟，在所述股动脉的近端和远端进行结扎，进行爆裂强度测试。 It was observed for 20 minutes ligated proximal and distal ends of the femoral artery after complete hemostasis, burst strength test. 所述织物修复的伤口耐受了高至300mmHg的动脉压强。 The wound repair fabric resistant to high arterial pressure of 300mmHg. [0211 ] 通过将脂肪垫放置在伤口上对右侧股动脉穿刺伤口进行处理。  processing the right femoral artery puncture wound by fat pad placed over the wound. 对该脂肪组织进行手动按压10秒钟。 Manually pressed for 10 seconds the adipose tissue. 手动按压释放后，该脂肪组织下有大量出血。 After you manually press release, this fatty tissue have a lot of bleeding. 未进行继续按压。 Not continue to be pressed. 1分27 秒后出血停止，20分钟后在所述股动脉的近端和远端进行结扎，进行爆裂强度测试。 1 minute 27 seconds after the cessation of bleeding, were ligated proximal and distal ends of the femoral artery for 20 minutes, a burst strength test. 所述脂肪组织修复的伤口在约60mmHg时失效。 The adipose tissue wound repair fail at about 60mmHg. 试验在大鼠3号上进行，雄性，555g。  No. 3 Tests were conducted on rats, male, 555g. 用壳聚糖-微孔多糖微球处理右侧的股动脉穿刺伤口，3mm2混合壳聚糖无纺织物的纱布用于覆盖伤口。 With chitosan - femoral artery puncture wound microporous polysaccharide microspheres on the right side of the process, chitosan non-woven fabric mixed gauze 3mm2 for covering wounds. 手动按压20秒，释放后实现完全止血。 Manual compression was 20 seconds, to achieve complete hemostasis after release. 观察20分钟后，在所述股动脉的近端和远端进行结扎，进行爆裂强度测试。 After observation for 20 minutes in the ligation of the femoral artery proximal and distal ends, and a burst strength test. 壳聚糖-微孔多糖微球贴片耐受了高至200mmHg的动脉压强。 Chitosan - microporous polysaccharide microsphere patch to withstand high arterial pressure of 200mmHg. 用脂肪组织覆盖右侧股动脉穿刺伤口。 Covering the right femoral artery puncture wound with adipose tissue. 对该脂肪组织手动按压20秒，手动按压释放后有大量出血。 Press 20 seconds for the manual adipose tissue, there is heavy bleeding after a manual press release. 连续手动按压1分21 秒后出血停止。 Continuous manual pressure 1 min 21 seconds after the bleeding has stopped. 随后，在所述股动脉的近端和远端进行结扎，进行爆裂强度测试，该脂肪组织贴片在低于120mmHg(约60)时失效。 Subsequently, the proximal and distal ends of the femoral artery ligation burst strength test, the adipose tissue below 120mmHg failure patch (about 60). 大鼠测试证明壳聚糖_微孔多糖微球纱布在面对脆性血管的穿刺伤口的活跃出血时，可非常有效地实现完全止血。  Rats tested Chitosan _ microporous polysaccharide microspheres gauze puncture wound in the face of a brittle active bleeding vessel, can be achieved very effectively complete hemostasis. 壳聚糖-微孔多糖微球织物止血所需的时间为20秒到56秒。 Chitosan - Time microporous polysaccharide microsphere fabric hemostatic required 20 seconds to 56 seconds. 这可能是由于微孔多糖微球在壳聚糖无纺织物贴片上的不均勻分布所致。 This may be due to the microporous polysaccharide microspheres on the uneven distribution of the nonwoven fabric caused by the chitosan patch. 壳聚糖-微孔多糖微球贴片非常牢固地粘附到血管，并在失效前可有效地耐受较高的动脉压力。 Chitosan - microporous polysaccharide microsphere patch is firmly adhered to the blood vessel, and can effectively withstand high arterial pressure before failure. 大鼠股动脉穿刺模型是研究止血和组织粘附机制的优良的筛选系统，并可筛选各种壳聚糖-微孔多糖微球制剂。 Rat femoral artery puncture screening system is an excellent model hemostatic and tissue adhesion mechanisms, and screening of various chitosan - microporous polysaccharide microsphere preparation. 在致命的大动脉损伤横切股动脉和股静脉的情况下进行测试。  In the case of testing fatal aortic transection injury femoral artery and vein. 与采用的其它方法相比，所述壳聚糖-MPH蓬松物提供了显著的止血作用。 Compared with other methods employed, the chitosan puff -MPH provides significant hemostatic effect. 在得克萨斯圣安东尼奥的美国军事外科研究所开发了这一用于进行止血剂测试的模型，目的是确定用于高压动脉出血的最优止血敷料。  In the United States Institute of Military Surgery, San Antonio, Texas developed the model for testing hemostatic agents, with the aim to determine the optimal hemostatic dressing for high pressure arterial bleeding. 该损伤是在血压正常猪的远端主动脉上的标准穿刺孔。 This damage is a standard puncture hole in the distal aorta of pigs with normal blood pressure. 对这一100%致命的损伤评估了9种不同的止血敷料。 100% of the fatal injuries were evaluated nine different hemostatic dressing. 只有接受了美国红十字会纤维蛋白敷料（纤维蛋白和凝血酶）或伤口接受了缝合修复的动物存活了60 分钟。 Only by accepting the American Red Cross dressing fibrin (fibrin and thrombin) or wound underwent suture repair of the animals survived for 60 minutes. 包括NAG在内的其它止血剂，未能控制动脉出血，且没有动物存活超过60分钟。 Other hemostatic agents include NAG, including failure to control arterial bleeding, and no animals survived more than 60 minutes. 这些实验中不包括壳聚糖和微孔多糖微球。 These experiments do not include microporous polysaccharide microspheres and chitosan. 研究了5组，每组5只猪（40kg，未成年的约克郡杂交猪，雄性）。  studied the 5 groups of 5 pigs (40kg, minor Yorkshire crossbred pigs, male). 一组用美国红十字会纤维蛋白敷料处理，另四组用含或不含微孔多糖微球壳聚糖织物和含或不含微孔多糖微球的壳聚糖毛绒处理。 A group treated with the American Red Cross Fibrin Dressing, with the other four groups with or without microporous polysaccharide microspheres and chitosan fabric with or without chitosan fleece treated microporous polysaccharide microspheres. 单独的微孔多糖微球通常不能控制活跃的动脉出血，不包括在内。 Microporous polysaccharide microspheres alone generally can not control active arterial bleeding, are not included. 在先的实验证明了未处理损伤的致死性，以及可通过缝合修复来拯救该动物。 Prior experiments proved fatal untreated injuries, as well as to save the animal by suture repair. 该研究的目的是比较美国红十字会敷料和壳聚糖为基础的敷料。 The purpose of this study was to compare the American Red Cross dressings and chitosan-based dressing. 测定了存活率、血液损失和维持正常血压所需的IV复苏液体的量。 IV Determination of the amount of liquid necessary for survival recovery, blood loss and maintain normal blood pressure. 预先对动物用药（Telazol 4_6mg/kg IM(肌肉内），Robinul 0. 01mg/kg IM)，用1-3%的异氟烷和氧气维持气管内麻醉，且中心温度维持在37° -39°C。  pre-treatment of the animals (Telazol 4_6mg / kg IM (intramuscular), Robinul 0. 01mg / kg IM), endotracheal anesthesia was maintained with 1-3% isoflurane and oxygen, and the center temperature was maintained at 37 ° -39 ° C. 放置留置式动脉插管，用于近端（颈动脉）和远端（股动脉）MAP(平均动脉BP测定），插入股IV插管用于复苏液体给药。 Indwelling arterial placed, for proximal (carotid) and distal (femoral artery) the MAP (mean arterial BP measurement), a cannula inserted into the femoral IV fluid administration for resuscitation. 对猪进行脾切除，对脾称重，并用替代液体溶液（3x脾重量的温的乳酸盐林格氏液）给药，以矫正去除的血（脾）。 Swine underwent splenectomy, spleen weighed and dosed with an alternative liquid solution (3x temperature spleen weight lactate Ringer's solution) to correct the blood removal (spleen). 脾切除后10分钟内，达到了血液动力学稳定，在动脉穿刺之前获得动脉血样品(12ml)。  10 minutes after splenectomy, hemodynamic stabilization to reach, obtain arterial blood sample (12ml) prior to arterial puncture. 主动脉闭塞后立即造成动脉损伤，且损伤后30分钟和60分钟抽取动脉血。 Immediately after occlusion of the aorta caused by arterial injury, and 30 minutes after injury and 60 min arterial blood. 测定凝血酶原时间、活化的局部促凝血酶原激酶时间、纤维蛋白原浓度、凝血弹性描记图、全血计数、乳酸和动脉血气。 Prothrombin time, activated partial thromboplastin time, fibrinogen concentration, FIG TEG, complete blood count, lactate and arterial blood gases. 在脾切除和10分钟的稳定期后，在两侧侧腹隐窝放置连续抽吸的引流管。  After splenectomy and 10 minutes stabilization period, it is placed in the recess flanks on both sides of a continuous suction drainage tube. 通过称量随时间的血损失来确定出血速率，并表示为每10秒的累计克数。 Bleeding rate determined by weighing of blood loss over time, and expressed as a cumulative number of 10 seconds per g. 在伤口位置的上游和下游横断夹住动脉后，（远端主动脉分叉处以上3cm，进行4. 4mm的主动脉孔穿刺的主动脉切开）移除横断夹。 After the upstream and downstream transverse wound site sandwiched artery (aorta above the bifurcation of the distal end of 3cm, aortic puncture hole 4. 4mm aortic incision) removing the transverse folder. 最初，在未进行血管加压的情况下通过将手指放在孔上填塞出血。 Initially, in the absence of a blood vessel by pressing a finger on the obturator hole bleeding. 在时刻0，手指放松填塞，使得活跃出血6秒。 At time 0, finger relax tamponade, making active bleeding in 6 seconds. 收集血液，通过将血液引入用于引流的腹膜腔中来监测血液损失速率。 Blood was collected by the blood into the peritoneal cavity for drainage of blood loss rate monitored. 将聚乙烯弹性片置于敷料和带手套的手之间，并在活跃出血6秒后将测试的止血敷料应用4分钟。  The elastic sheet is interposed between the polyethylene and the gloved hand of the dressing, and tested after brisk bleeding hemostatic dressings 6 seconds for 4 minutes. 进行主动脉完全闭塞的手动按压，表现为无脉搏的股动脉BP (MAP为15mmHg)。 Complete occlusion of the aorta manual pressure, the performance of BP pulseless femoral artery (MAP to 15mmHg). 4分钟后，松开手动按压，将所述织物和塑料片留在受伤位点上。 After 4 minutes, release the manual compression, the fabric and plastic sheet left on the site of injury. 观察2分钟受伤位点的出血情况。 Observed two minutes of the bleeding site of injury. 关键的终点是观察两分钟后完全没有出血。 The key endpoint was observed no bleeding after two minutes. 如果出血仍在持续，再按压4 分钟。 If bleeding continues, then press 4 minutes. 在活动出血或无止血的事件中，不再进行复苏而让动物死亡。 In the event no active bleeding, or hemostasis, resuscitation and let no animals died. 为了在没有出血迹象的条件下测试所述测试敷料的粘附性，用37°C的乳酸林格氏液以300ml/分钟IV的速率进行复苏。 To test the in the absence of signs of bleeding tested for adhesion of the dressing, resuscitation with lactated Ringer's solution at a rate of 37 ° C 300ml / min of IV. 在动脉切开术前基线MAP加或减5mmHg处再保持60分钟。 Before baseline MAP arteriotomy plus or minus 60 minutes and then at 5mmHg. 死亡（关键终点）是MAP < IOmmHg,且呼气末的PCO2低于15mmHg。 Death (end key) is a MAP <IOmmHg, and end expiratory PCO2 lower than 15mmHg. 在实验期的末尾（对存活动物在1小时时实行安乐死）移除主动脉，切开并评估。 At the end of the experimental period (the implementation of the surviving animals were euthanized at 1 hour) to remove the aorta, dissected and evaluated. 在对损伤进行观测和拍照后，检测孔的大小以确保损伤大小均一，且固定样本用于组织学实验，以评估止血过程（纤维蛋白、血小板、延伸至内腔）。 After damage observation and photographing, detecting hole size to ensure uniform lesion size, and fixed samples for histological experiments to assess hemostasis (fibrin, platelets, extends to the lumen). 虽然，在该模型中，ARC止血敷料具有一定的存活率，但其仍有缺点。  Although, in this model, the ARC haemostatic dressing has a certain survival rate, but it still has drawbacks. 除了前述的参数外，“理想”的止血敷料控制了大血管的动脉、静脉和软组织的出血，粘附到血管伤口而非手套或手上，柔韧、持久且廉价，在极端环境下稳定，并具有长的储存期，无需混合、没有传播疾病的危险，无需新的训练，并且由容易获得的材料制成。 In addition to the aforementioned parameters, the "ideal" hemostatic dressings control the arteries, veins and blood vessels hemorrhage large soft tissue, vascular adhesion to wound rather than gloves or hands, flexible, durable and inexpensive, stable in extreme environments, and It has a long shelf life, no mixing, no risk of disease transmission, no new training, and is made of a material readily available. 在当前设置中测试或评估的敷料中没有一种满足所有这些性质。 In the current setup dressings tested or evaluated none satisfy all of these properties. 纤维蛋白-凝血酶美国红十字会战场敷料（ARC)的缺点是其目前的形式太脆。 Fibrin - American Red Cross battlefield dressing thrombin (ARC) drawback is its current form is too brittle. 该战场敷料干燥时又硬又厚，并且当握紧该战场敷料时，某些冻干材料会剥落。 The drying time and battlefield dressing hard and thick, and when the gripping battlefield dressing, some lyophilized material may peel. 当湿润时，该纤维蛋白-凝血酶会粘附到乳胶手套和皮肤上。 When wet, the fibrin - thrombin adheres to the skin and latex gloves. 含有MPH的壳聚糖毛绒的操作特性优于这些现有技术的材料。 Chitosan fleece operating characteristics superior to those materials containing MPH prior art. 该模型有大量用于评估新型血管密封装置的背景文献。  The model used to evaluate a large number of new blood vessels Background Document sealing device. 借助用Seldinger技术通过含插入的导管的经皮放置的标准血管鞘（7 French)对股动脉进行了研究。 By Seldinger technique through a catheter inserted percutaneously placed containing standard vascular sheath (7 French) of the femoral artery were studied. 总共采用了20只动物，10只用IV肝素（150单位/千克）抗凝至活化凝血时间（ACT)为正常的3 倍。 A total of 20 animals were employed, 10 IV with heparin (150 units / kg) anticoagulant to activated clotting time (ACT) was three times normal. 在所述密封装置插入前检测ACT。 Said sealing means prior to insertion detecting ACT. 未肝素化的动物的对侧股动脉用作对照，仅用手动按压来实现止血。 Unheparinized contralateral femoral artery of the animal used as a control, only manual compression hemostasis is achieved. 将动脉鞘和导管遗留在原位1小时以模拟插入时间。 The arterial sheath and the catheter left in place for 1 hour to simulate insertion time. 在一股动脉中使用含壳聚糖-MPH的血管密封装置，而在另一股动脉上采用手动按压。 Using the vessel containing chitosan -MPH sealing means in an artery, while the manual pressing on the other femoral artery. 释放应用到穿刺位点的手动压力，并每5分钟检查以下关键终点：外部出血或血肿形成、大腿周长测量、远端足脉搏的完整性及实现止血所需的手动按压时间。 Manual pressure is applied to release the puncture site, and every 5 minutes to check the key endpoints: external bleeding or hematoma formation, measurement of thigh circumference, the integrity of the distal foot and pulse time needed to achieve hemostasis manual pressing. 对动物继续观察90分钟，然后用过剂量的IV 戊巴比妥钠和饱和的氯化钾安乐死。 Continue to observe the animals 90 minutes, and then an overdose of sodium pentobarbital IV, and saturated potassium chloride euthanasia. 安乐死前，对每组的动物进行股动脉血管造影。 Before euthanasia of animals per group femoral artery angiography. 一小组动物存活，随后在2周时进行检查。  a group animals survived, followed by examination at 2 weeks. 这些检查包括物理检查动脉入口、评估末梢脉搏、股动脉血管造影及对切开的股动脉穿刺位点和周围组织进行组织病理学检查。 These checks include arterial access physical examination, assessment distal pulses, femoral artery and the femoral artery angiographic puncture site and surrounding tissue incised for histopathological examination. 统计学分析表示为平均标准偏差。 Statistical analysis expressed as mean standard deviation. 用未配对student' s t-检验来比较不同处理组的平均止血时间。 Used to compare the different treatment groups average time to hemostasis of unpaired student 's t- test. 在进行人体临床试验之前进行了初步动物研究。 Before conducting human clinical trials conducted a preliminary animal studies. 含微孔多糖微球的壳聚糖毛绒和含微孔多糖微球的壳聚糖织物在控制血液损失及其它测试的参数方面均显示出较好的性能。 Containing microporous polysaccharide microspheres and chitosan chitosan fleece fabric comprising a microporous polysaccharide microspheres both exhibit superior performance in controlling blood loss and parameters of other tests. 该模型被美国军队战斗伤亡管理研究项目广泛测试。  The model is extensively tested the US Army combat casualty management research projects. 有大量的关于伤害程度和对各种止血剂的反应的数据基线。 There are a lot of baseline data on the extent of the damage and response to various hemostatic agent. 该数据包括大直径静脉的伤害程度，将止血敷料应用于大面积出血面的能力，血液损失的程度，设备操作，致命性，以及实验性肝损伤的再生性的资料。 The extent of damage data includes a large diameter vein, the hemostatic dressing applied to a large area of ​​capacity bleeding surface, the degree of blood loss, operating equipment, lethal, and regeneration of liver injury in experimental data. 所述美国红十字会止血敷料（ARC)和实验的壳聚糖乙酸酯海绵在该模型中都是有效的止血剂。 The American Red Cross haemostatic dressing (ARC) and experimental sponges, chitosan acetate is effective in this model hemostatic agent. 军队研究者决定准许壳聚糖和美国红十字会止血敷料（ARC)的进一步研究和开发。 The researchers decided to allow the army and the American Red Cross Chitosan Hemostatic Dressing (ARC) to further research and development. 在猪严重大静脉出血模型中检验了壳聚糖（毛绒、织物，含有或不含有微孔多糖微球） 和ARC敷料的止血效力。 Inspection chitosan (plush fabric, with or without microporous polysaccharide microspheres) severe vein bleeding in a porcine model and ARC dressing hemostatic efficacy. 推荐的用于治疗V级肝损伤（广泛的薄壁组织损伤并发主血管破口）的常规治疗方法是用纱布海绵填塞，及随后再次手术。 Recommended conventional treatment methods for the treatment of Class V liver injury (tissue damage complicated by a wide range of thin-walled main blood vessels break) is sponge filled with gauze, and subsequent surgery. 从未借助这些止血剂解决生物降解性和伤口愈合的问题。 These hemostatic agents never solve the problem by means of biodegradability and wound healing. 因此，损伤后一个月将存活的动物处死，以检查愈合的伤口和止血剂降解。 Thus, one month after injury surviving animals were sacrificed to examine wound healing and hemostatic agent degradation. 在一个月时间内通过每周肝CT扫描来监测止血控制。 Within a month of time to monitor liver hemostasis control by CT scan every week. 再出血的迹象需要剖腹手术和处死动物来介入。 Signs of rebleeding require laparotomy and sacrificed to intervene. 监测了动物的损伤后和止血修复过程。 After monitoring the animals and damage repair process to stop bleeding. 将杂交的商业化猪（雄性，40_45kg)分为6组，每组5只。  The commercial hybrid pigs (male, 40_45kg) divided into six groups of five each. 实验组由纱布包扎、ARC 敷料、含有或不含微孔多糖微球的壳聚糖毛绒，和含有或不含微孔多糖微球的壳聚糖织物构成。 Experimental group of gauze bandage, dressing the ARC, comprising chitosan fleece with or without microporous polysaccharide microspheres and chitosan fabric with or without microporous polysaccharide microspheres configuration. 手术准备和麻醉如对所述主动脉穿刺损伤模型一样。 Surgery and anesthesia as ready as the aorta puncture injury model. 放置颈动脉和颈静脉导管，并完成脾切除和膀胱导管放置。 Placing the carotid artery and jugular vein catheters and complete splenectomy and urinary bladder catheter placement. 同时达到了血液动力学（MAP稳定15分钟）和代谢（直肠温度38-40°C，动脉血pH7. 39-7.41)稳定。 While achieving hemodynamic (MAP to stabilize for 15 minutes) and metabolic (rectal temperature of 38-40 ° C, arterial pH7. 39-7.41) stable. 获得动脉血液样品。 Arterial blood samples were obtained. 每一实验动物必须具有正常的血细胞比容、血色素浓度、血小板计数、凝血酶原时间、活化的局部促凝血酶原激酶时间， 和血浆纤维蛋白原浓度，这些都将包括在本研究中。 For each animal must have a normal hematocrit, hemoglobin concentration, platelet count, prothrombin time, activated partial thromboplastin time, and plasma fibrinogen levels, which are included in the present study. 在两侧放置引流管（如在主动脉切开术中一样）以计算血损失速率和量。 Placed on both sides of the drainage tube (as in the aortotomy) to calculate the rate and amount of blood loss. 如在先出版物中所述诱导肝损伤。 As in the prior publication induce liver injury. 基本上，使用专门设计的“ X ”形的钳子来造成两个穿破的肝破口，该钳子包括4. 5cm的尖锐的尖端和基板。 Basically, the use of specially designed "X" shaped tongs two perforation caused liver lacerations, the forceps includes a sharp tip and the substrate 4. 5cm. 标准化的肝损伤是贯穿的星状伤口，涉及左内叶静脉、右内叶静脉、肝门静脉和肝软组织。 Standardized liver injury is star-shaped wound through involving the left lobe cava, right in the leaf vein, hepatic portal vein and liver soft tissue. 损伤后30秒，开始以260ml/分钟的速率供应温的（39°C )乳酸盐林格氏液以恢复基线MAP。 30 seconds after injury, started at a rate of 260ml / min supply of warm (39 ° C) Ringer's lactate solution to restore the baseline MAP. 在开始供给IV液体的同时，应用实验的止血辅料，通过在背腹方向标准化地应用压力来进行手动按压。 Simultaneously with the start of the supply of IV liquid, hemostasis excipients application experiments, carried out by manual pressure applied in the dorsoventral direction, the normalized pressure. 1分钟后，检查伤口的出血情况。 After 1 minute, check the bleeding wound. 如果未完全止血，则在内侧旁方向再次施压。 If it does not completely stop the bleeding, then the next direction of the inner pressure again. 将该序列重复4次，按压60秒。 This sequence was repeated 4 times, pressed for 60 seconds. 止血的关键终点定义为伤口不存在任何可观测到的出血。 It is defined as the end of the key hemostatic wound observed any bleeding does not exist. 应用止血处理后，将动物的腹部暂时关闭，并对该动物观察60分钟。 After hemostatic treatment, the animals of the abdomen is temporarily closed, and the animal was observed for 60 minutes. 死亡的终点是脉搏为0。 Death is the end of the pulse is 0. 处理应用前的定量收集的血液定义为“处理前血液损失”，在研究阶段结束时的定量收集的血液为“处理后血液损失”。 Quantitative definition of blood collected before processing applications for the "pre-treatment blood loss," Quantitative collected at the end of the study period blood as "post-treatment blood loss." 止血剂中的血液不包括在内，但包括总的IV液体替换，并确定估计的损伤前血液体积。 Hemostatic agents not included in the blood, but includes a total replacement of the IV fluid, prior to the injury and to determine the estimated blood volume. 用发明该方法的军队报导的个体评分系统来估计所述止血辅料的粘附强度。  with a self-reported rating system forces the method of the present invention to estimate the hemostatic adhesive strength excipients. 分数为从1到5 ；1 =无粘附，2 =轻微，3 =粘附导致与止血剂接触的组织伸长，但不能将肝提离肝床（table)，4 =粘附足以将肝部分提离肝床，及5 =粘附足以将肝提离肝床。 Score from 1 to 5; 1 = no adhesion, 2 = mild, 3 = adhesion to result in contact with the tissue elongate hemostatic agent, but can not be lifted off the liver liver bed (table), 4 = sufficient adhesion liver liftoff liver bed section, and 5 = adhesion sufficient liftoff liver liver bed. 来自每只动物的三种辅料的平均分数视为粘附强度的单一值。 The average scores of three kinds of materials from each animal as a single value of the adhesion strength. 关键终点是存活，死亡，处理前血液损失，处理后血液损失，存活时间，在1、2、3和4分钟时止血，和％复苏液体体积。  The key endpoints are alive, death, loss of blood before treatment, post-treatment blood loss, survival time, hemostasis 1,2,3 and 4 minutes, and the recovery liquid volume%. 损伤的关键参数是破损的血管数目相关的处理前血液损失，表示为ml和ml/kg体重。 The key parameter is the number of damaged blood vessels to injury pretreatment blood loss associated with, and expressed as ml ml / kg body weight. 含有微孔多糖微球的壳聚糖毛绒和含有微孔多糖微球的壳聚糖织物在控制血液损失及其它测试参数方面均表现出更好的性能。  chitosan fleece containing microporous polysaccharide microspheres and chitosan fabric comprising a microporous polysaccharide microspheres in the control of blood loss, and other parameters of the test have shown better performance. 该模型提供了在具有增强的毛细血管血流（舌头)和高纤维蛋白溶解活性（口腔粘膜）的系统中的方便的止血测试。  This model provides a convenient having enhanced capillary blood flow (tongue) and a high fibrinolytic activity (oral mucosa) of the hemostasis test system. 该模型中可很容易地使血小板的功能被抑制以及被肝素化。 This model can easily make platelet function is inhibited and a heparinized. 已使用该模型来评估在稀乙酸中的液态壳聚糖的止血作用，关键终点为标准切开后出血时间减少。 The model has been used to assess the hemostatic effect of the liquid chitosan in dilute acetic acid, the end of the key criteria of bleeding time after cutting is reduced. 该模型的描述已经公开出版了，并为待比较的结果提供了基线数据。 The model has been described in the published, and provide baseline data for the results to be compared. 将被认为对毛细管出血具有高度止血作用的NAG的止血效力与含有或不含微孔多糖微球的壳聚糖毛绒和含有或不含微孔多糖微球的壳聚糖织物进行比较。 Hemostatic efficacy  would be considered highly capillary bleeding hemostatic effect of chitosan fleece NAG with or without microporous polysaccharide microspheres and chitosan fabric with or without microporous polysaccharide microspheres were Compare. 关键终点是舌的出血时间，即以分钟表示的从应用止血剂到完全止血的时间。 The key end of the tongue bleeding time, i.e., from the application of the hemostatic agent to complete hemostasis time in minutes. 手术后1-14天对兔实施安乐死，并对损伤进行组织学评估。 1 to 14 days after surgery in rabbits were euthanized, and the damage histological evaluation. 研究了具有正常血液凝结状态、抑制了血小板活性、及肝素抗凝血化的兔。 Study of platelet activity, and anticoagulant heparin of rabbits with normal blood coagulation state, is suppressed. 使用Klokkevold等开发的模型后，对5-61bs的新泽西白（NZW)兔进行舌止血研究，所述模型包括将特殊的金属支架缝合到舌头上，以稳定软组织并确保伤害一致。 After using the model developed Klokkevold the like, of New Jersey 5-61bs white (NZW) rabbits of tongue hemostasis, said model comprising a specific metal stent sutured to the tongue, to stabilize and to ensure consistency of soft tissue damage. 用有防护的15刃刀（guarded 15 blade knife)在侧边上对舌进行切开。 15 blade knife with a protection (guarded 15 blade knife) on the tongue side of the incision. 用Coles的滤纸方法来检测从切割时的出血时间。 Coles with filter paper method to detect bleeding time from the time of cutting. 每15秒钟提取斑渍，直到不发生血液着色。 Stains extracted every 15 seconds, until the blood coloration does not occur. 还测定系统出血和凝结时间。 Also bleeding and clotting time measurement system. 总共研究了6组每组5只共30只兔。 A total of six study groups each of five a total of 30 rabbits. 这6组由对照（未处理）、NAG、 含有或不含微孔多糖微球的壳聚糖毛绒和含有或不含微孔多糖微球的壳聚糖织物构成。 This group consisting of 6 control (untreated), NAG, with or without microporous polysaccharide microspheres and chitosan fleece with or without microporous polysaccharide microspheres composed of chitosan fabrics. 对动物进行麻醉（IM Ketamine HCI 35mg/kg和Xylazine 5mg/kg)后，将可视窥镜插入口中使其张开，将不锈钢支架缝合到舌头上以稳定组织。 After the animals were anesthetized (IM Ketamine HCI 35mg / kg and Xylazine 5mg / kg), so that a visible endoscope insertion port opened, the stainless steel stent sutured to the tongue tissue to stabilize. 用有防护的15刃在舌头的侧边上形成深2mm长15mm的舌切口。 15 with a protective edge forming a 15mm long 2mm deep cut in the tongue side of the tongue. 切口立即用止血剂处理，并检测出血时间。 Immediately treated with a hemostatic agent incision, bleeding time and detection. 采用切割前进行舌标记的方法来方便标记后的组织学切片。 Method for marking prior to cutting the tongue to facilitate histological sections after marking. 在5组每组5只用血小板功能拮抗剂依前列醇（环前列腺素或PGI2)处理的动物中进行与上述30只兔中相同的研究。 The same with the above-described 30 groups of 5 rabbits each antagonist studied process epoprostenol (prostacyclin or PGI2) with five animals in platelet function. 明确地遵循Klokkevold 的方案。 Klokkevold explicitly follow the program. 再次，在活性凝血时间延长3倍且平均收缩性出血时间增加40%之后，对30只兔进行研究。 Again, the activity after prolonged clotting time and 3 times the average shrinkage of bleeding time by 40%, and 30 rabbits were studied. 组织学检查包括SEM。 Histological examination including SEM. 含有微孔多糖微球的壳聚糖毛绒和含有微孔多糖微球的壳聚糖织物在控制口腔出血时均显示出更好的性能。 Chitosan and chitosan fleece fabric comprising a microporous polysaccharide microspheres containing microporous polysaccharide microspheres both exhibit better performance in controlling oral bleeding. 在一只猪（94kg)身上使用Hasan Alam博士开发的致命的腹股沟损伤模型进行1.5g的负载有微孔多糖微球的壳聚糖毛绒的试验，Hasan Alam博士是战地伤亡领域的创伤外科医生和研究专家，他是华盛顿（DC)医院中心的医务人员并服务于国防医科大学(USUHS)。  who use lethal groin injury model developed by Dr. Hasan Alam test 1.5g of chitosan fleece loaded with microporous polysaccharide microspheres in a pig (94kg), Dr. Hasan Alam is in the field of battlefield casualties trauma surgeon and researcher, he was the medical staff (DC) hospital Center in Washington and the defense Medical services (USUHS). 在割断股血管后，使出血持续进行直至所述动物失去大约相当于体重20至25ml/kg的血液。 After the cut femoral vessels, bleeding continues until the equivalent weight of the animal to lose about 20 to 25ml / kg of blood. 通过基于体重而不是出血时间的血液损失固定量，建立了更加一致的病理学。 By weight based on blood loss rather than a fixed amount of bleeding time, to establish a more consistent pathology. 失去固定量血液后，将1. 5g壳聚糖毛绒片置于所述伤口上。 After a fixed amount of blood loss, the sheet 1. 5g chitosan fleece was placed on the wound. 所述壳聚糖毛绒成功控制了从所述割断的血管中的出血。 The successful control of the chitosan fleece from said severed blood vessel bleeding. 然后用500ml羟乙基淀粉复苏，观察所述动物直至平均动脉压稳定在约45mmHg。 Then 500ml hydroxyethyl starch recovery, the animal was observed until the mean arterial pressure stabilized at about 45mmHg. 在观察期间没有观察到出血。 No bleeding was observed during the observation period. 在那时，给予额外的复苏以及钙和多巴胺以增加平均动脉压至95mmHg而无出血征候。 At that time, given extra calcium and dopamine recovery and to increase the mean arterial pressure to 95mmHg without bleeding symptoms. 所述动物被处死并检测所述毛绒。 The animals were sacrificed and the pile detected. 在另一只猪（87kg)身上试验改变的壳聚糖毛绒。  Test chitosan fleece body further altered pigs (87kg) in. 通过向毛绒中加入额外的微孔多糖微球改变所述壳聚糖毛绒以补偿在改变期间微孔多糖微球的任何损失。 The chitosan fleece changed by adding additional microporous polysaccharide microspheres to the pile to compensate for any loss of the microporous polysaccharide microspheres during changes. 应用成功并且在约一小时后使用羟乙基淀粉和多巴胺升高平均动脉压以给所述应用加压。 Successful application of the use of starch and after about an hour and dopamine to increase mean arterial pressure to the pressure application. 没有观察到出血，直至平均动脉压升高至约95mmHg，此时出血重新开始。 No bleeding was observed until the mean arterial pressure to about 95mmHg, bleeding resumed at this time. 移去所述毛绒。 Removing the pile. 观察到所述材料变得僵硬和坚固。 The material was observed to become stiff and strong. 在所述伤口上放置另一毛绒。 Another pile is placed on the wound. 之后，出血被控制。 After that, the bleeding was controlled. 该毛绒为含有微孔多糖微球的未改变的壳聚糖毛绒。 The pile is unaltered chitosan fleece containing microporous polysaccharide microspheres. 这两个应用均证明了必须在受伤血管上放置毛绒以实现控制严重的出血。  Both applications have proved to be placed in the plush injured blood vessels in order to achieve significant control bleeding. 少量出血发生在股部伤口的底部。 Unit bleeding occurs in the bottom portion of the wound. 如果将所述材料置于所述伤口的底部，出血不会得到控制。 If the material is placed in the bottom of the wound, bleeding is not controlled. 因此，优选将所述材料放置在伤口内以与股动脉接触。 Thus, preferably the material is placed in contact with a wound to the femoral artery. 总之，所述应用非常成功，并且提示当正确应用时，制剂有优良的功效。 In short, the application is very successful and prompt when correctly applied, the formulation has excellent effect. 以上描述公开了本发明的几种方法和材料。  foregoing description discloses several methods and materials of the present invention. 很容易对本发明的方法和材料进行修改，及对制造方法和设备进行替换。 Methods and materials for readily be modified according to the present invention, a method and apparatus for manufacturing and replacement. 基于本公开或本文所述发明的实施，这类修改对本领域所属技术人员是显而易见的。 Based on the present disclosure or embodiments of the invention described herein, such modifications of the ordinary skill in the art will be apparent. 因此，本发明不应限制为本文公开的具体实施方案，而应涵盖所有属于所附权利要求中发明的实际范围和精神内的修改和替换。 Accordingly, the present invention should not be limited to the specific embodiments disclosed herein, but is to be a true scope and modifications and alterations within the spirit of the appended claims, all belonging to the invention. 本文引用的全部专利、 申请和其它文献的全部内容并入本文作为参考。 Entirety herein by reference All patents, applications, and other references are incorporated herein by reference. 1.止血材料，其中所述止血材料是包含壳聚糖纤维和辅助止血剂的无纺织物或纺织织物，其中所述壳聚糖具有SOOkDa至1500kDa的分子量以及90%或更高的脱乙酰度，以及其中所述壳聚糖纤维已用弱酸进行了处理，使所述壳聚糖纤维彼此紧固，形成网状结构；其中所述弱酸选自冰醋酸、乙酸溶液、乳酸、柠檬酸和羟乙酸；其中所述辅助止血剂选自凝固因子浓缩物、重组因子Vila、alphanate FVIII浓缩物、 bioclate FVIII monoclate-P FVIII haemate P FVIII> von Willebrand因子浓缩物、helixate FVIII 浓缩物、hemophil-M FVIII 浓缩物、humate-P FVIII 浓缩物、 porcine FVIII ί农If·、 koate HP FVIII ί农If·、 kogenate FVIII ί农If·、recombinate FVIII 浓缩物、mononine FIX 浓缩物和fibrogammin P FXIII 浓缩物。 1. hemostatic material, wherein the hemostatic material comprising chitosan non-woven fabric or fiber woven fabric and an auxiliary hemostatic agent, wherein the chitosan has a molecular weight SOOkDa 1500kDa to 90% or higher, and a degree of deacetylation , and wherein the chitosan fibers have been treated with a weak acid, the chitosan fibers fastened to each other to form a network structure; wherein the weak acid is selected from acetic acid, acetic acid, lactic acid, citric acid and glycolic acid; wherein said auxiliary hemostatic agent is selected from the coagulation factor concentrates, recombinant factor Vila, alphanate FVIII concentrate, bioclate FVIII monoclate-P FVIII haemate P FVIII> von Willebrand factor concentrate, helixate FVIII concentrate, hemophil-M FVIII concentrate thereof, humate-P FVIII concentrate, porcine FVIII ί agricultural If ·, koate HP FVIII ί agricultural If ·, kogenate FVIII ί agricultural If ·, recombinate FVIII concentrate, mononine FIX concentrate and fibrogammin P FXIII concentrate. 2.如权利要求1所述的止血材料，其中所述弱酸的pH值为3. 0至4. 5。 The hemostatic material as claimed in claim 1, pH wherein said weak acid is 3.0 to 4.5. 3.如权利要求1所述的止血材料，其中所述止血材料包括具有粗糙面和平滑面的无纺织物。 The hemostatic material as claimed in claim 1, wherein the hemostatic material comprises a nonwoven fabric having a rough surface and a smooth surface. 4.如权利要求1所述的止血材料，其中所述止血材料包括两面均为粗糙面的无纺织物。 4. The hemostatic material according to claim 1, wherein the hemostatic material comprises a nonwoven fabric on both sides, a rough surface. 5.如权利要求1所述的止血材料，其中所述止血材料包括多个壳聚糖纤维层。 The hemostatic material according to claim 1, wherein the hemostatic material comprises a plurality of chitosan fiber layers. 6.如权利要求1所述的止血材料，其中所述壳聚糖纤维经过乙酸溶液处理。 Hemostatic material of claim 1 wherein the chitosan fibers have been treated acetic acid solution as claimed in claim. 7.如权利要求1所述的止血材料，其中所述壳聚糖纤维经过冰醋酸处理。 7. The hemostatic material according to claim 1, wherein the chitosan fibers are treated with glacial acetic acid. 8.止血材料在制备用于处理伤口的伤口敷料中的用途，其中所述止血材料是包含壳聚糖纤维和辅助止血剂的无纺织物或纺织织物，其中所述壳聚糖具有SOOkDa至1500kDa的分子量以及90%或更高的脱乙酰度，以及其中所述壳聚糖纤维已用弱酸进行了处理，使所述壳聚糖纤维彼此紧固，形成网状结构；其中所述弱酸选自冰醋酸、乙酸溶液、乳酸、柠檬酸和羟乙酸；其中所述辅助止血剂选自凝固因子浓缩物、重组因子Vila、alphanate FVIII浓缩物、 bioclate FVIII monoclate-P FVIII haemate P FVIII> von Willebrand因子浓缩物、helixate FVIII 浓缩物、hemophil-M FVIII 浓缩物、humate-P FVIII 浓缩物、 porcine FVIII ί农If·、 koate HP FVIII ί农If·、 kogenate FVIII ί农If·、recombinate FVIII 浓缩物、mononine FIX 浓缩物和fibrogammin P FXIII 浓缩物。 8. haemostatic material in the manufacture of a wound dressing for treating a wound in use, wherein the hemostatic material comprising chitosan non-woven fabric or fiber woven fabric and an auxiliary hemostatic agent, wherein the chitosan has SOOkDa to 1500kDa the molecular weight and degree of deacetylation of 90% or higher, and wherein the chitosan fibers have been treated with a weak acid, the chitosan fibers fastened to each other to form a network structure; wherein the weak acid is selected from acetic acid, acetic acid, lactic acid, citric acid and glycolic acid; wherein said auxiliary hemostatic agent is selected from clotting factor concentrates, recombinant factor Vila, alphanate FVIII concentrate, bioclate FVIII monoclate-P FVIII haemate P FVIII> von Willebrand factor concentrate thereof, helixate FVIII concentrate, hemophil-M FVIII concentrate, humate-P FVIII concentrate, porcine FVIII ί agricultural If ·, koate HP FVIII ί agricultural If ·, kogenate FVIII ί agricultural If ·, recombinate FVIII concentrate, mononine FIX fibrogammin P FXIII concentrate and was concentrated. 9.如权利要求8所述的用途，其中所述伤口选自瘤床、肝脏伤口和脑部伤口。 9. The use according to claim 8, wherein the tumor is selected from the wound bed, the wound liver and brain wound. 10.如权利要求8所述的用途，其中所述伤口选自动脉穿刺伤口、静脉穿刺伤口、动脉破口伤口和静脉破口伤口。 10. The use according to claim 8, wherein said wound is selected from arterial puncture wound, a venous puncture wound, arterial laceration wound, and a venous laceration wound. 11.如权利要求8所述的用途，其中所述壳聚糖纤维经过冰醋酸处理。 11. The use according to claim 8, wherein the chitosan fibers are treated with glacial acetic acid. 杨健等.壳聚糖的止血机理和应用.国外医学生物医学工程分册　第24 卷 第2 期.2001,第24 卷(第2 期),77-80.